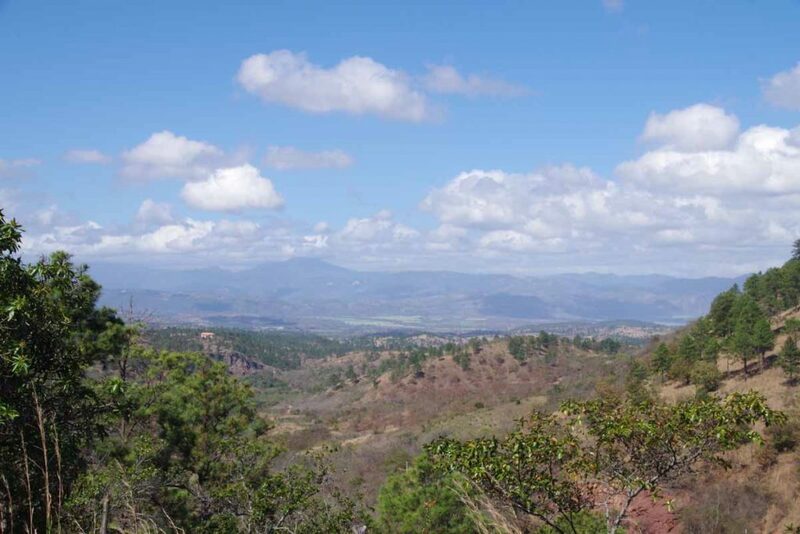 Over the hills and into Nicaragua! 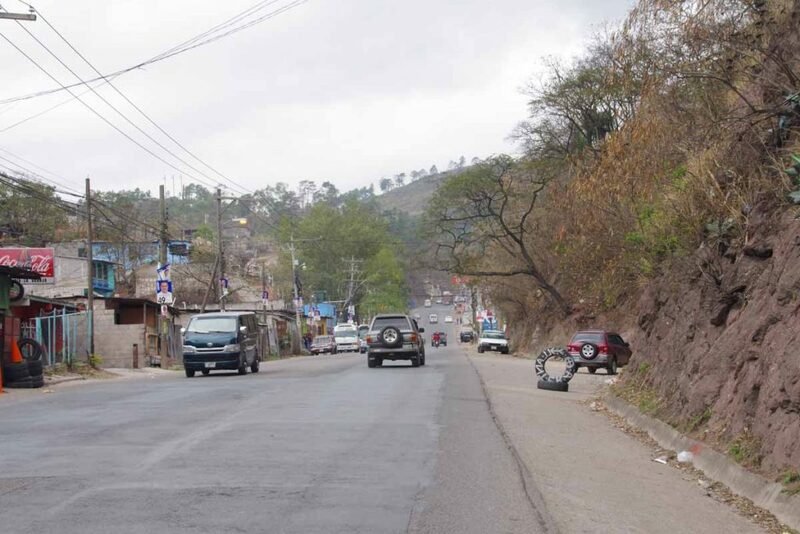 We entered Honduras climbing a hill and left it climbing one too. In between, there were a few hills. 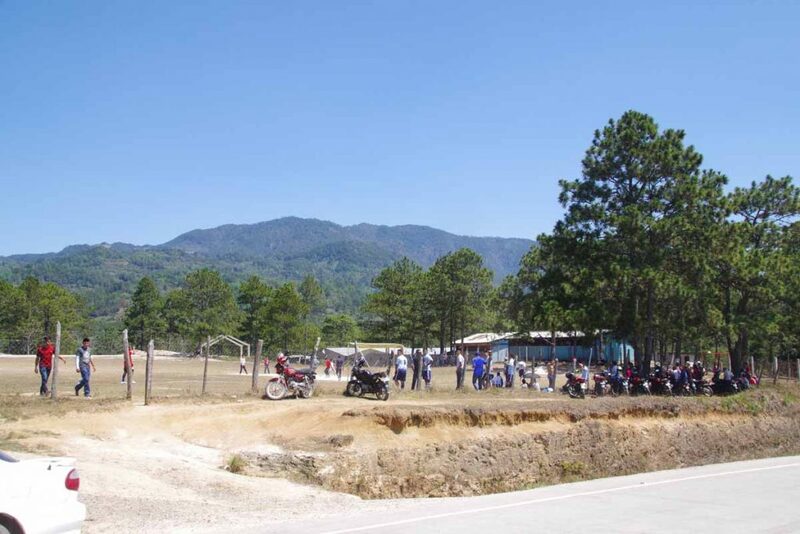 Overall, enjoyed time in Honduras with roads better than expected and friendly people. As we left Danli, it was on edge of drizzle. 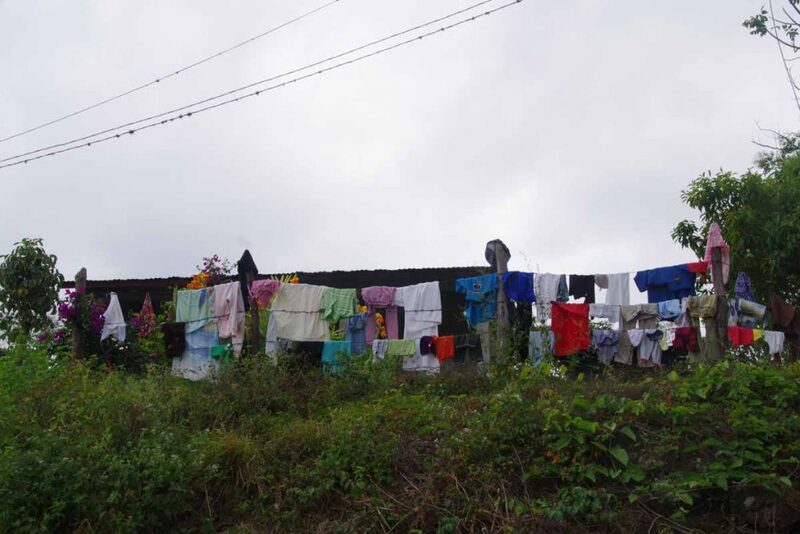 However, not so wet that clothes couldn’t be hung on the barbed wire to dry. Within a few kilometers it all dried up. 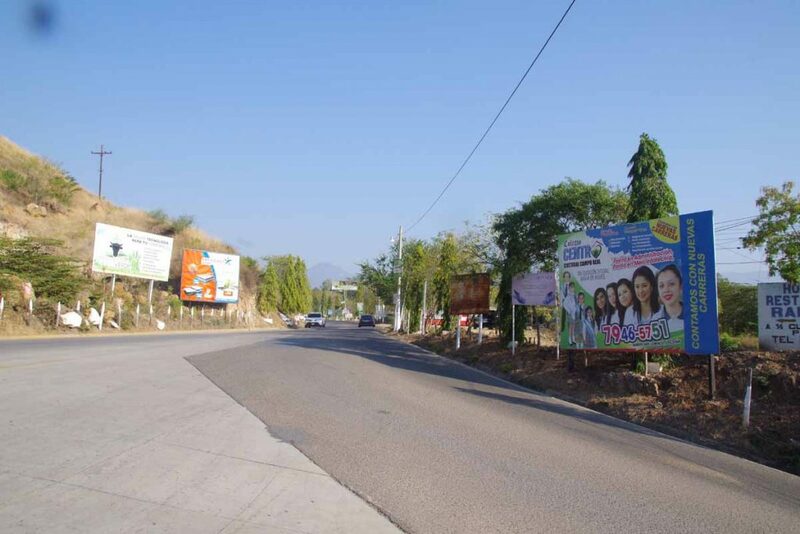 We continue to see election posters. This region seems to have more of the existing government (blue stars) and earlier west of Tegus, we had more of an opposition party (red stripes). 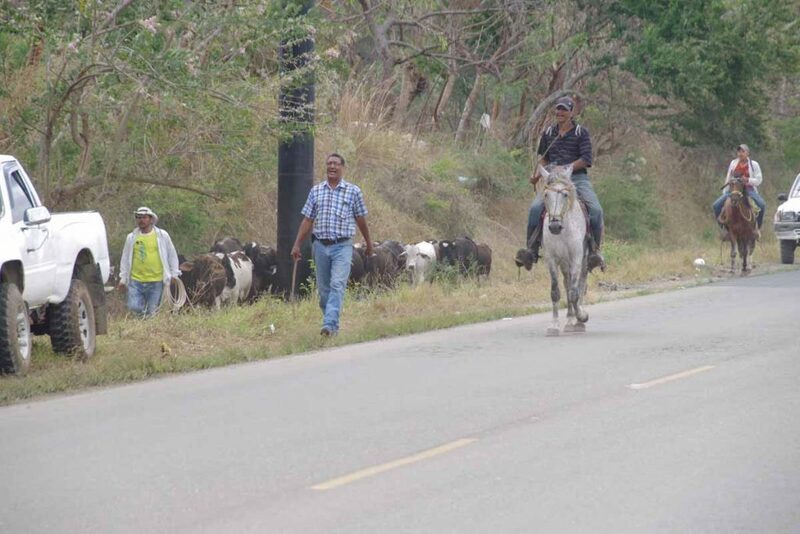 There was a cattle drive, complete with horses going on along the highway. After 20km of slightly rolling hills we came to El Paraiso. 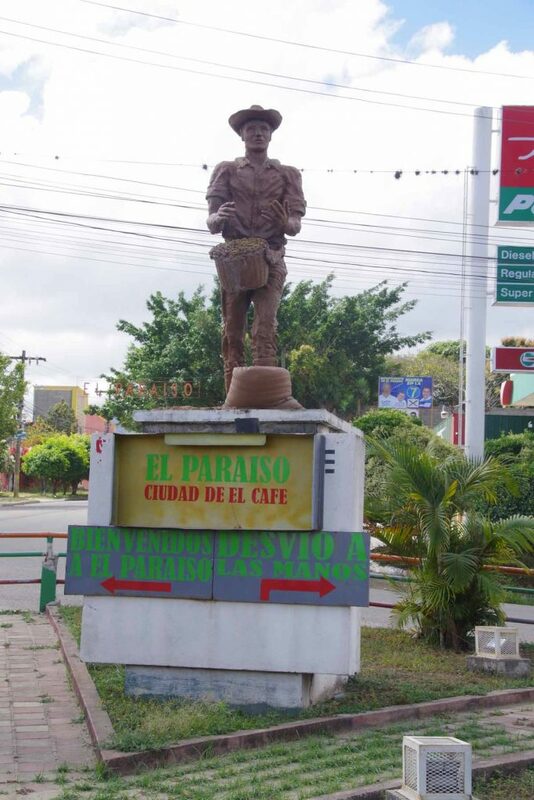 El Pariaso bills itself as the coffee city and is last major settlement before the border. An example of truck full of people. 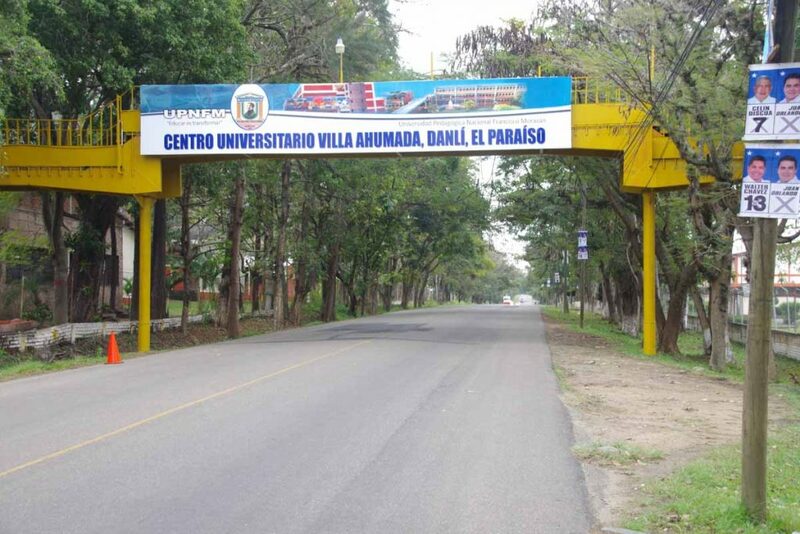 After El Paraiso, the next 10km were up, sometimes steeply so. 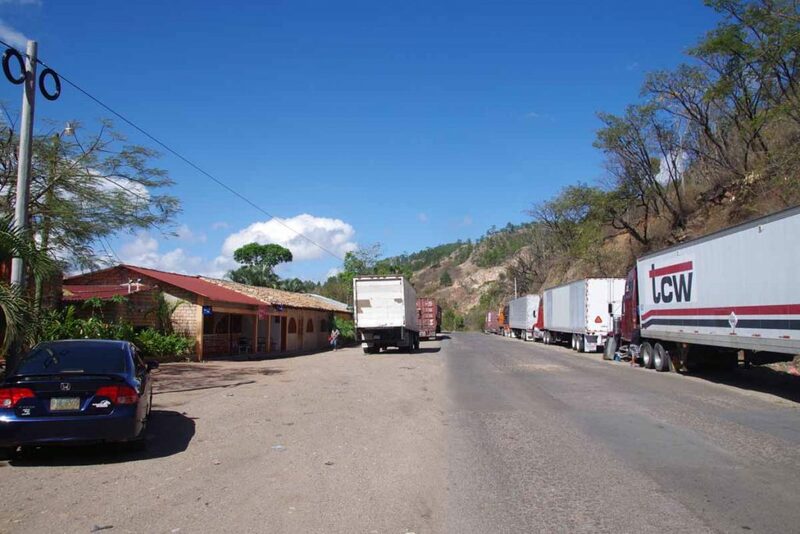 Just before the border was a customary line of trucks. 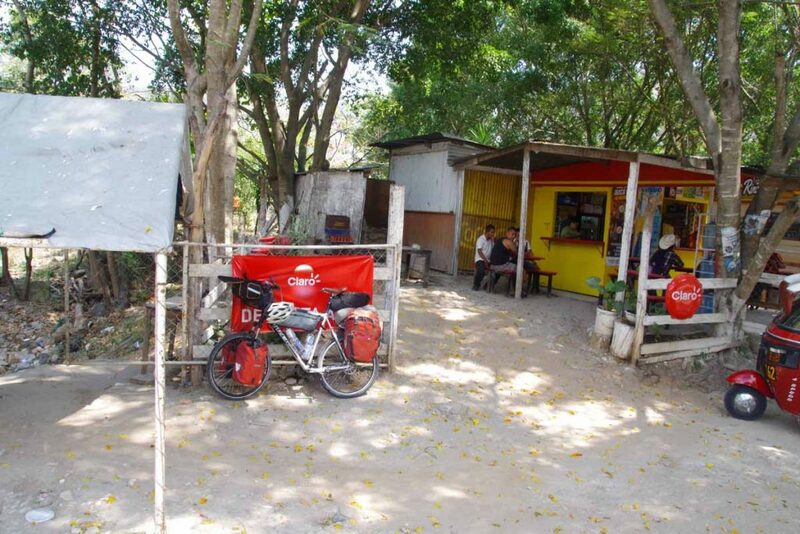 We spent our last small bills buying some lunch on the Honduras side. 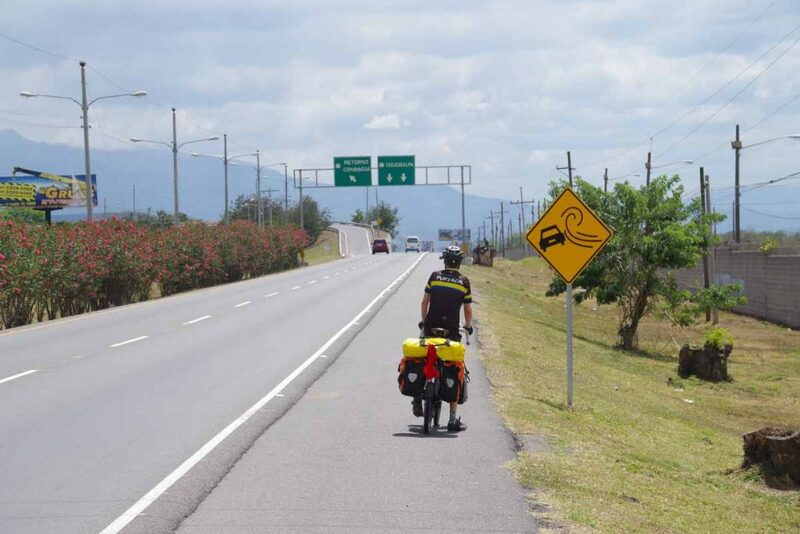 Exiting Honduras was very straightforward. 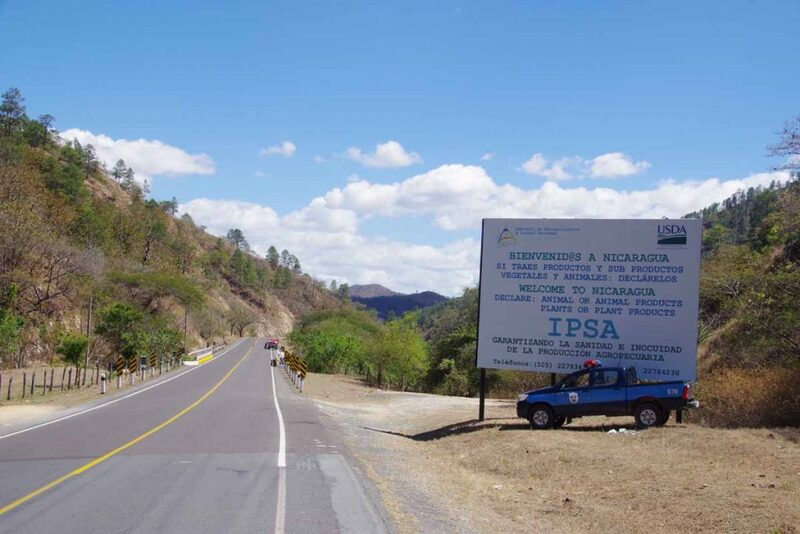 It took a little more time to get through the Nicaragua border. First stop was the “health check”. They looked through my passport, asked my age and then handed me a small slip of paper. Despite this warning nobody asked for a yellow fever certificate. Next stop was immigration. We were told the fee was $12, USD. 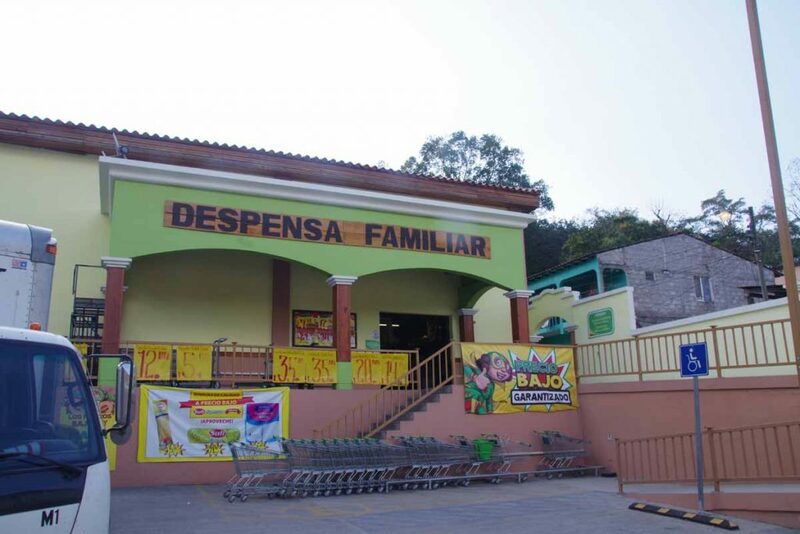 I tried to pay in Honduran, but they said they only accepted US $. When I pulled out a Honduran note, they signaled over one of the money changers, so I did go back and pull out a $20 bill. I gave this and took them a long time to eventually produce a receipt and change. Not five minutes after handing me $8 in change, the official then claimed he handed me $10 and I owed him another $2. Nope, that wasn’t going to fly and we told him so. 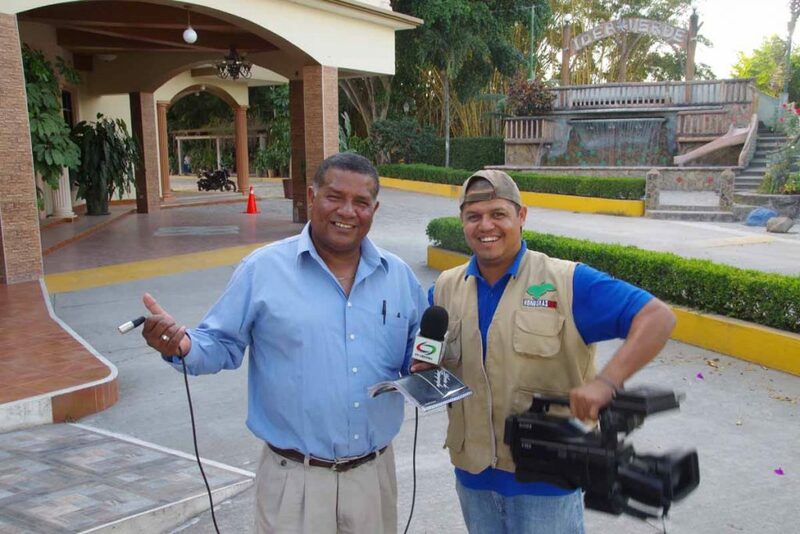 After this exchanging our remaining Honduran currency for Nicaraguan. Fortunately got a rate pretty close to international rate. Hooray, we were now done and could descend downwards into Nicaragua. 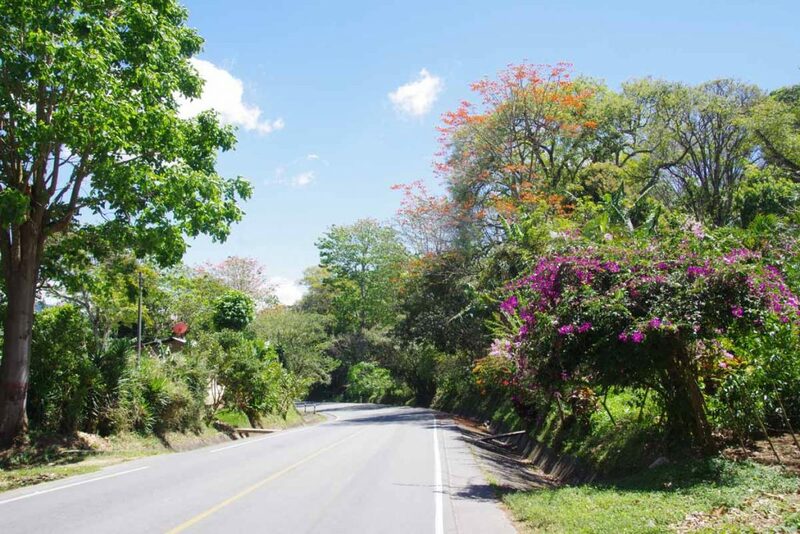 We started out with beautiful roads, lush vegetation and nice descent. 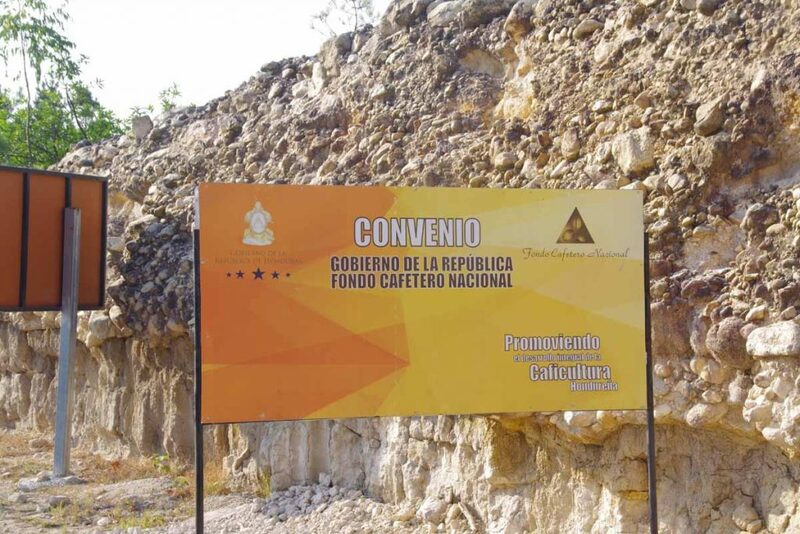 Signs now gave us distances to places in Nicaragua. A little lower there was an agricultural check. 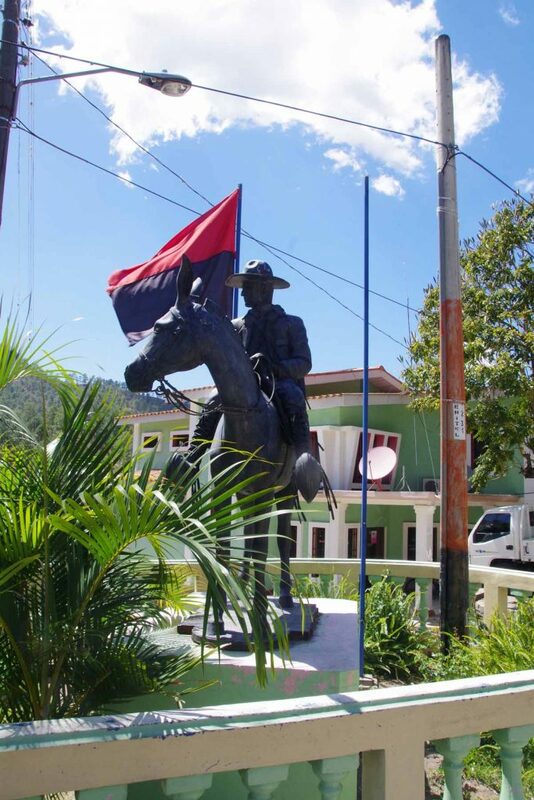 Town of Dipilto had this statue. 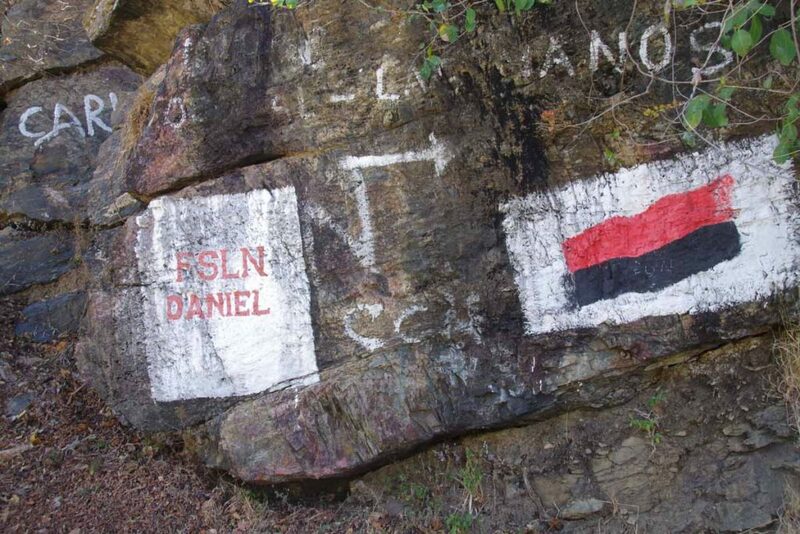 FSLN (Sandinistas) seem to be prominent here with several FSLN signs as well as red and black colors. 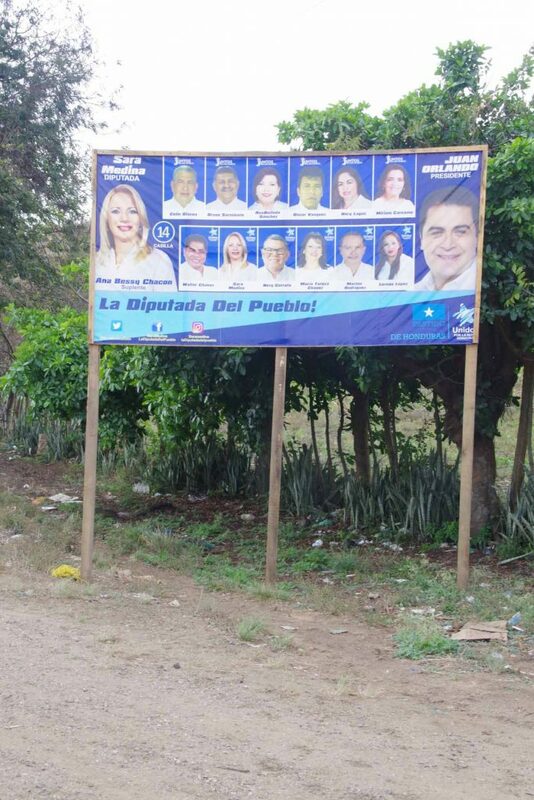 A poster for the current party. Without much difficulty we made our way to Ocotol. 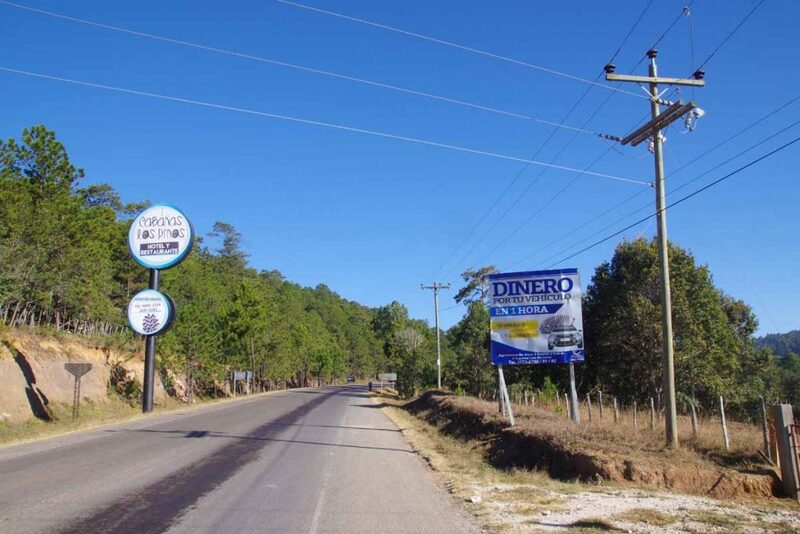 The main road didn’t have many open businesses on it and we were most of way through town before finding a hotel. Otherwise nice ride and good to get into Nicaragua. An easy, shorter ride today. 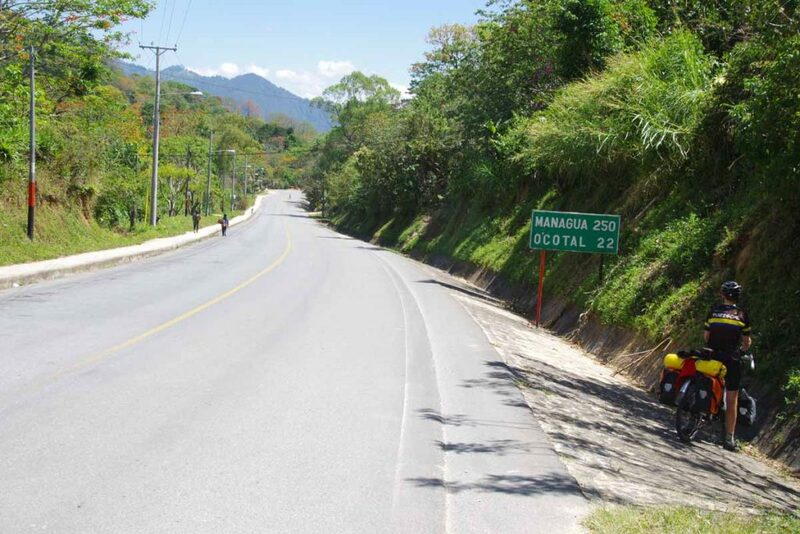 Ojo de Agua is small cross roads with a junction on road from Tegucigalpa to Danli. 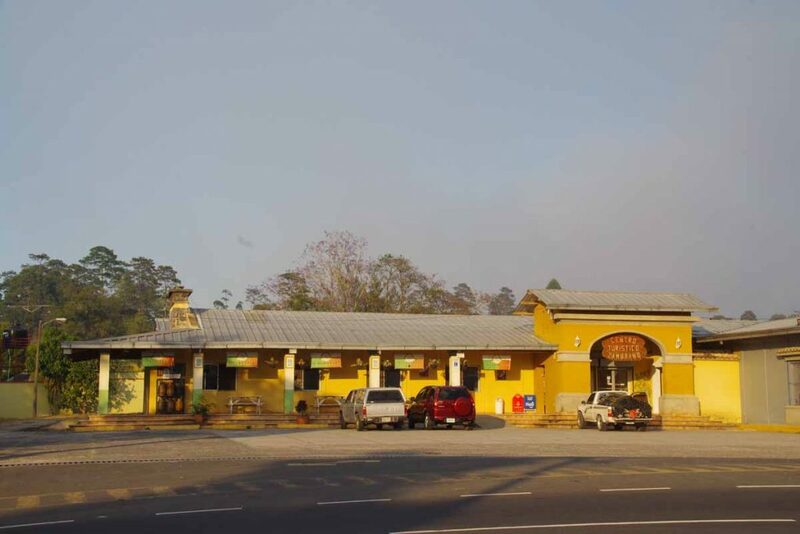 There is a large Puma gasoline station and convenience store, a comedors, a motorcycle shop and our hotel. Still quiet at 6am when I visited the gas station to buy some juice. 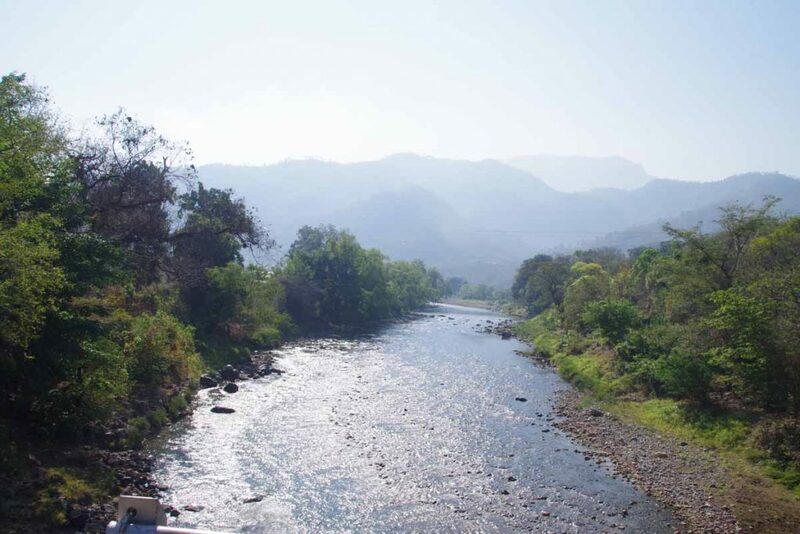 We cycled separately today as I preferred to get some riding in earlier and spend some of the short day in Danli. The road was both narrower and rougher today than yesterday. However, traffic still light enough to manage. One sometimes gets a sense of a comedor based on how many trucks are parked out front. This one at 15km certainly had its share. After this some shorter steep hills to climb over. Had some nice views on the way up. At top was a small village with this church. An example of the local buses that are frequent on the roads here. 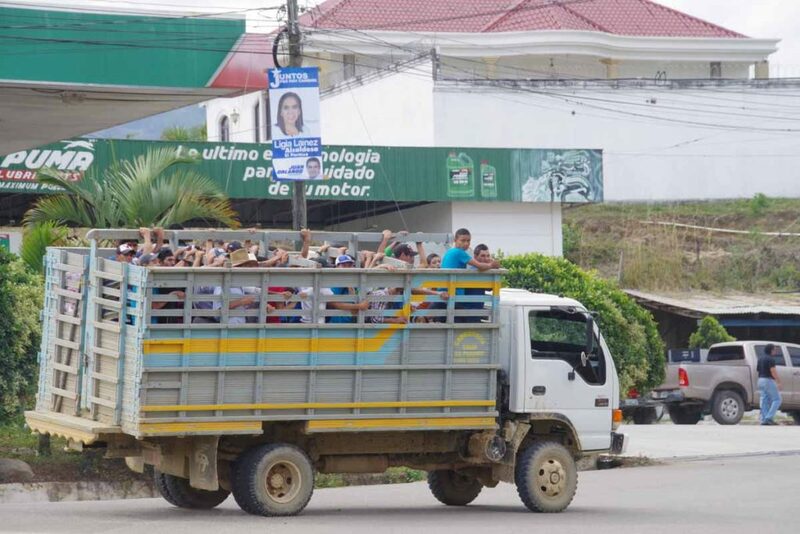 Not as noisy or loud as the chicken buses in Guatemala. These guys were interested in watching the guy with the bike. A few kilometers down the road, met these cyclists with several bikes in back of their pickup. 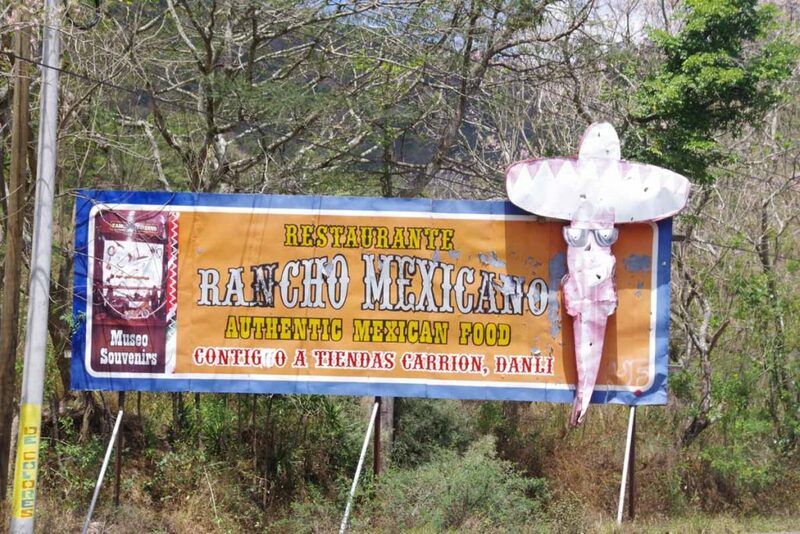 Found it interesting to see this sign with English words describing a Mexican restaurant in Honduras. I saw multiple trucks and buses today with these banners and flags. 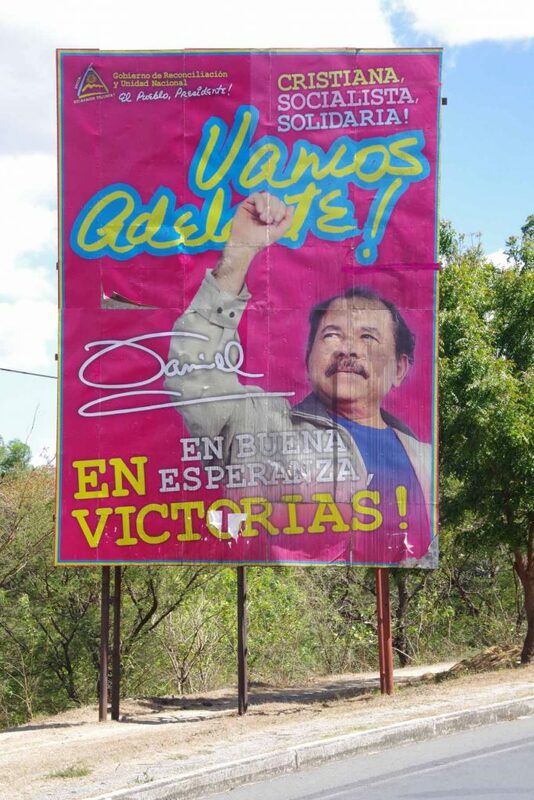 Also seem to have posters for one of the political candidates. Without too much trouble, found my way to our designated hotel rendezvous by about 12:30pm. Had a leisurely lunch and otherwise relaxed in the room. David came in a few hours later. 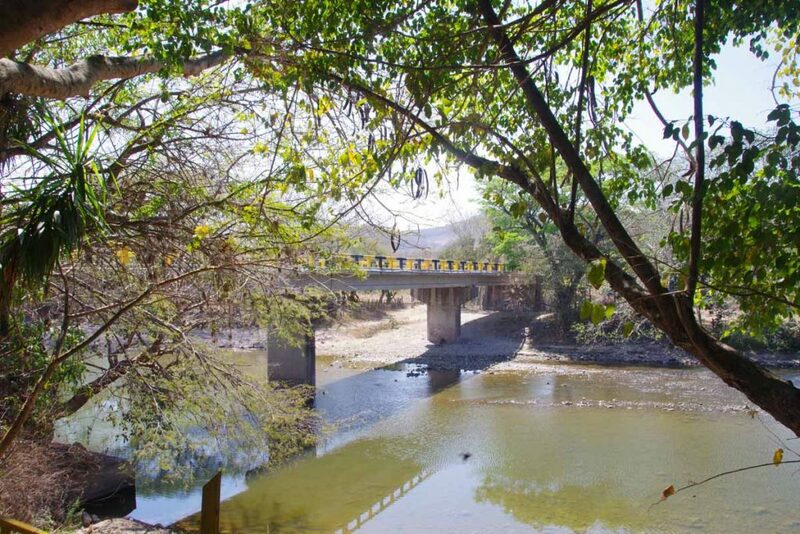 Plan is to cross into Nicaragua tomorrow. Escaped from the big city and climbed some hills to more rural areas. The first 15km of the ride was quite busy – though typically enough places to ride on edge of the road. We started by walking bikes past construction zone nearby that had shut down the street. After this, followed surfaces streets up and over some short hills. At 3km, we joined start of the peripheral highway. This was four lanes of traffic but wide enough for bikes on the right as well. We had some nice views looking back at the city. 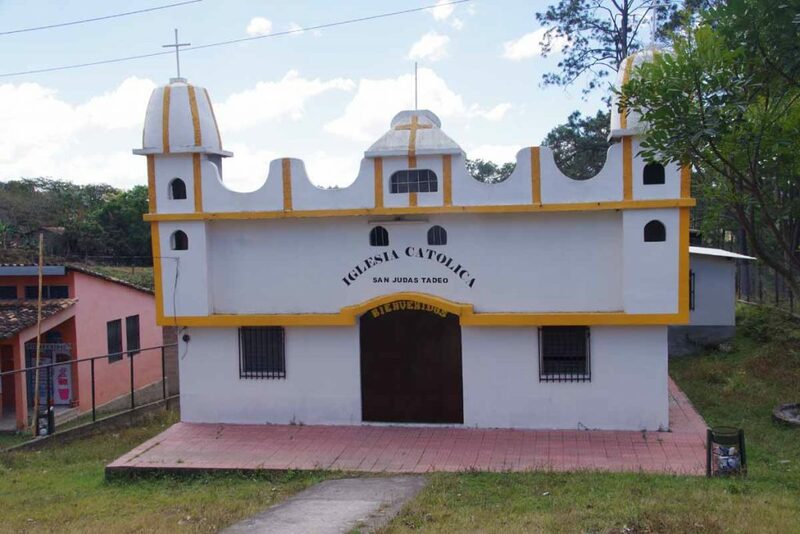 While we haven’t ever felt unsafe and take precautions, Honduras has had a reputation as violent similar as some US cities (Honduras is similar to New Orleans, Guatemala similar to Baltimore, El Salvador like Detroit – source). 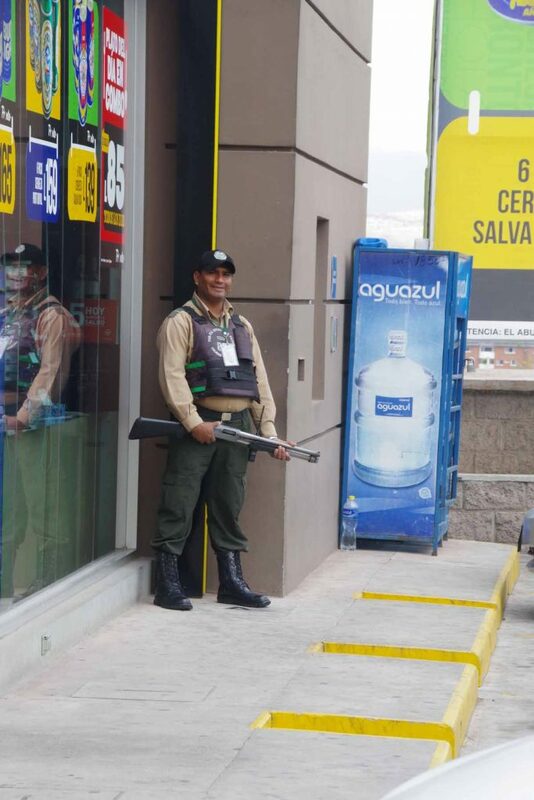 What we have seen in a number of places are guards with shotguns similar to this guy. At 10km, we turned from the major highway. 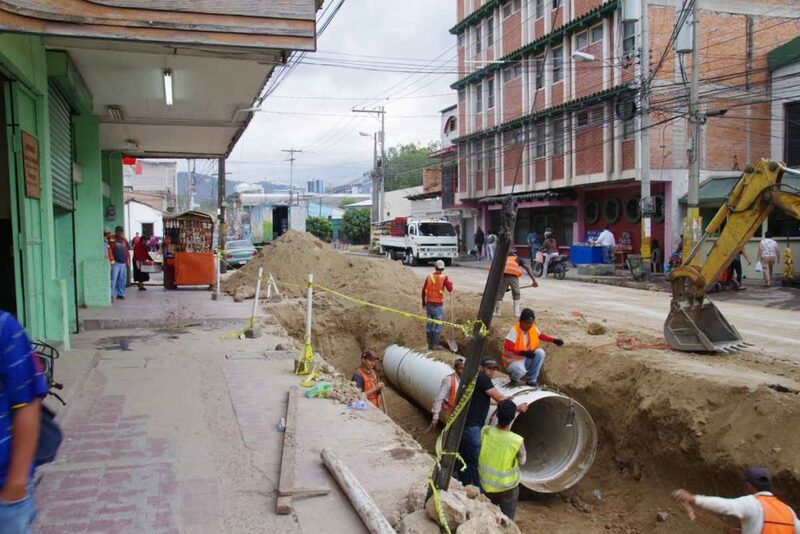 The route was initially very busy as we came through neighborhoods, past construction and slowly up a hill. 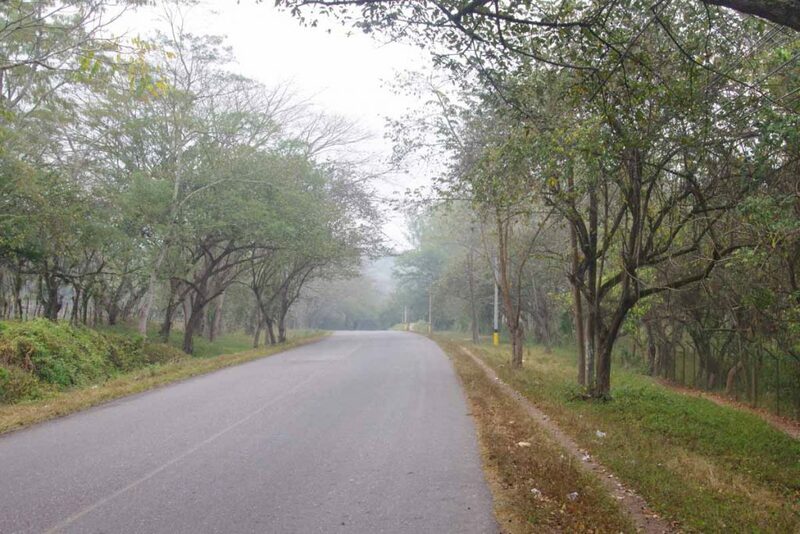 Within a few kilometers the road turned quieter. 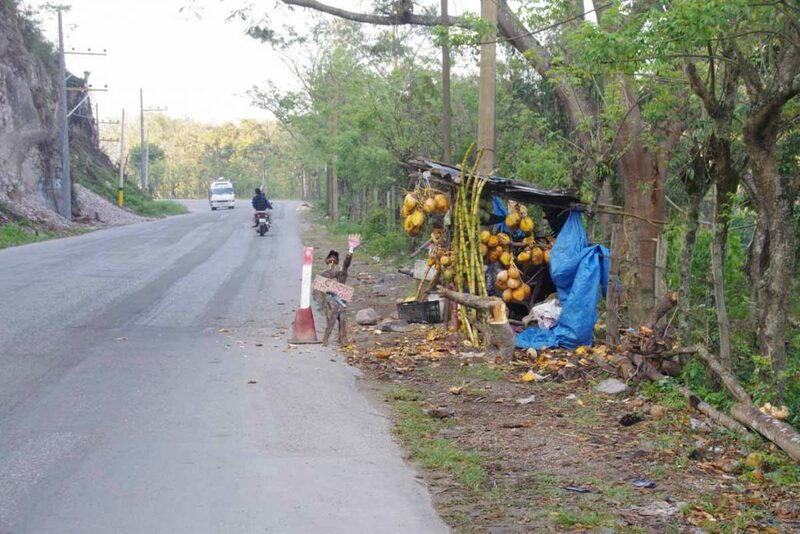 We stopped at this fruit stand where I had an orange. From this point, the road was two lanes with a reasonable shoulder the rest of the way. Above the fruit stand you can also see an election sign. Apparently, elections scheduled for November. At the fruit stand we had already climbed ~300m and we had another 300m more, along with some drops, before reaching the top. It was 16C (60F) here. The sky had been overcast with occasional hints of drizzle all day. Also had a reasonable wind, though often blocked by the trees. Stopping at the top felt cold – but we used it as an excuse to stop for early lunch at a comedor. Lunch was a bit overpriced. 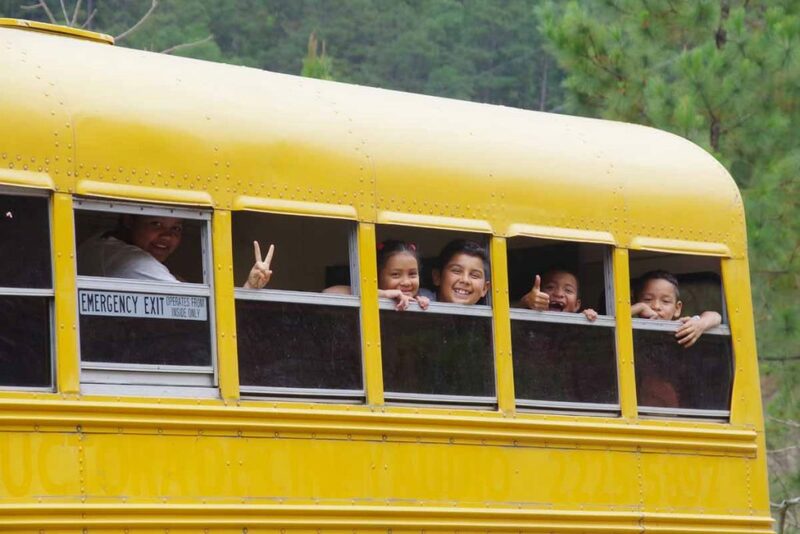 Not much later, these kids looking out the school bus windows. These guys yelled to get their photo as well, so I did. 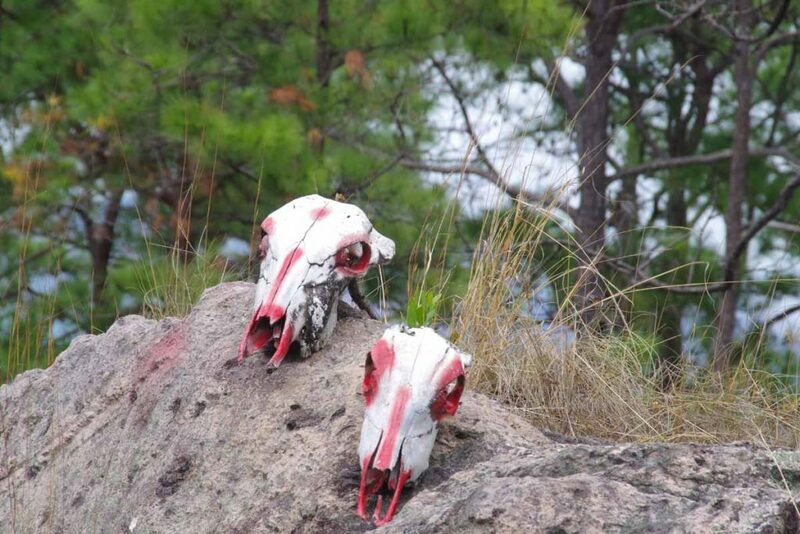 Somewhat later along the way, someone had placed several cow skulls along the road. 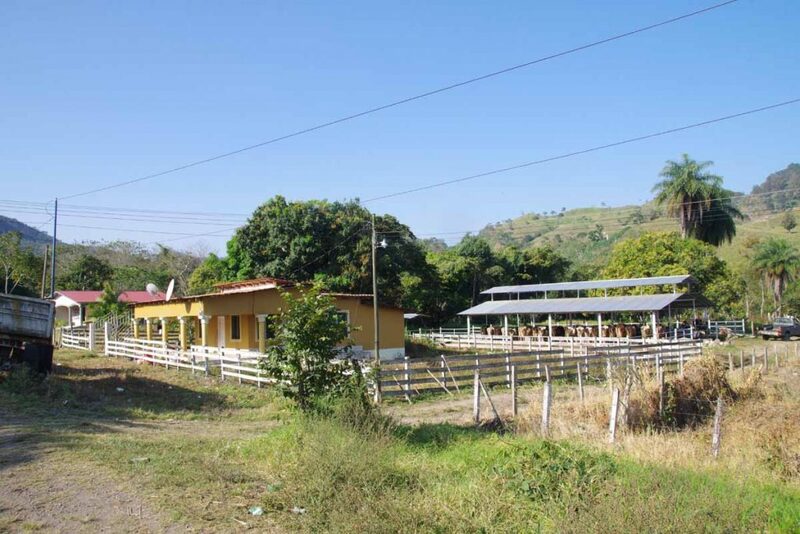 Our last riding continued to be hilly, but without too much difficulty found our way to small village of Ojos de Agua. Even a nice little hotel here. 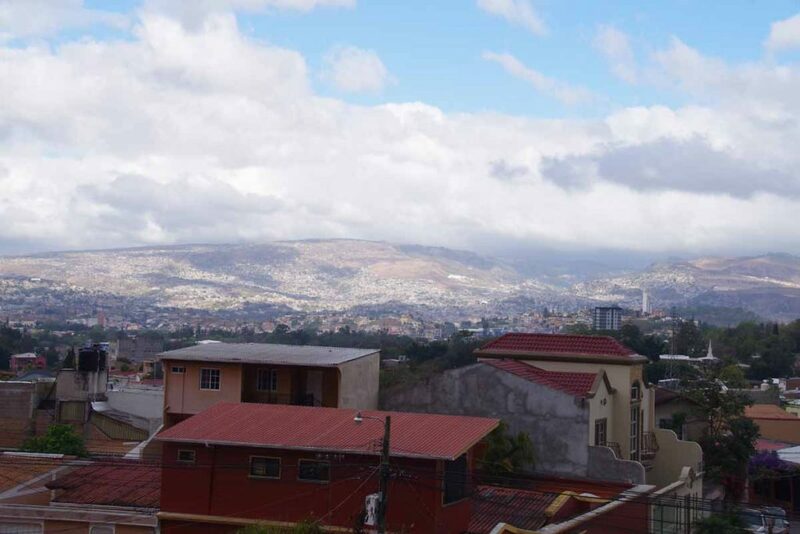 A hilly capital city for a hilly country. Other than the hills, entry into this metropolis of one million people was easier than expected. 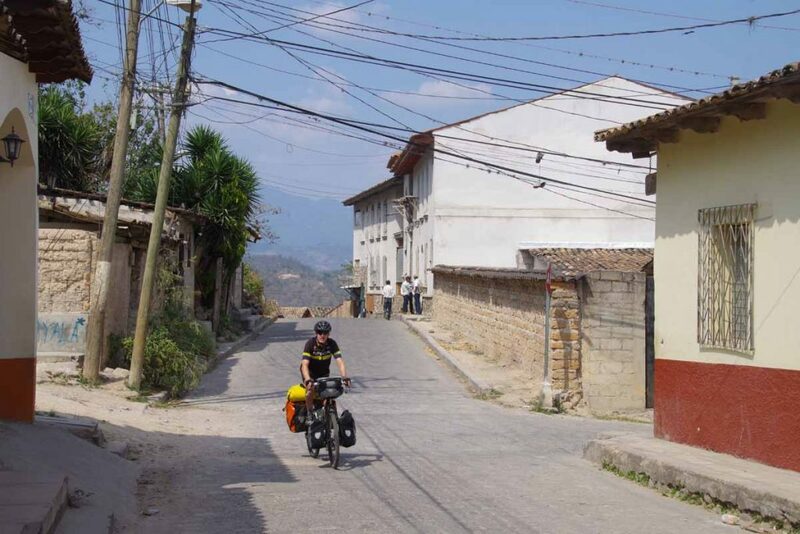 We took two days to ride from Siguatepeque to Tegucigalpa. First day was longer with an 800m climb and second day was easier. Full day cycling today mostly on a good four lane highway. Still a lot of climb and descent, on a busier road. Our hotel room came with breakfast included, so nice to get some pancakes before starting. 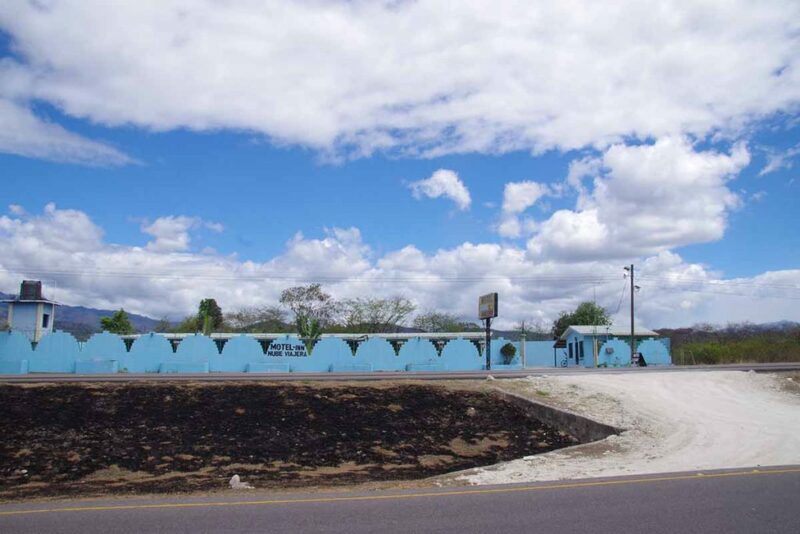 We started on busy highway along town. After few kilometers we passed through a toll booth. As in Mexico, the attendants waved us through past the tolls. Car fare was L 19 or slightly less than a dollar. After this short hill, we had mostly descent. 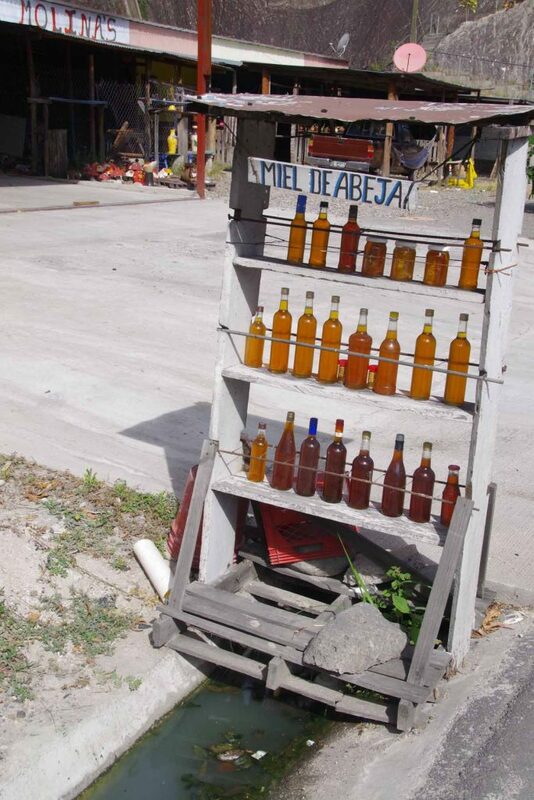 Places along the way were selling honey. Also places selling painted handicrafts. 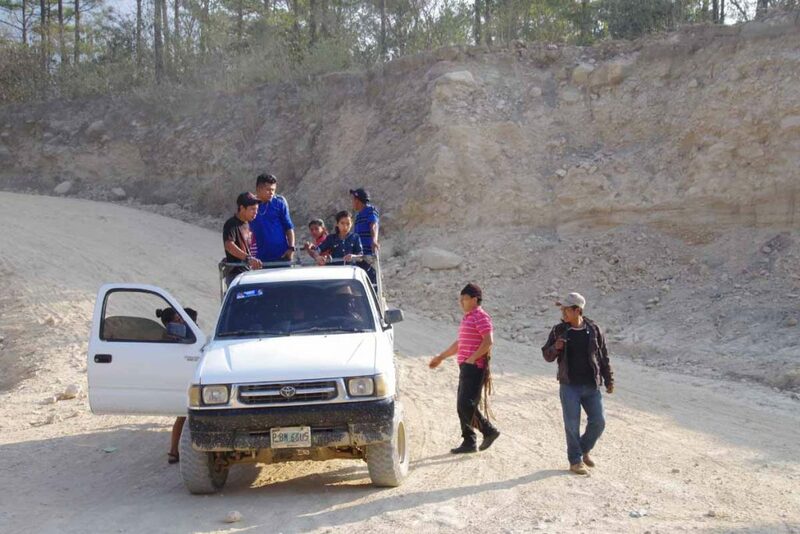 Our road descended and followed a river before climbing to local maximum. 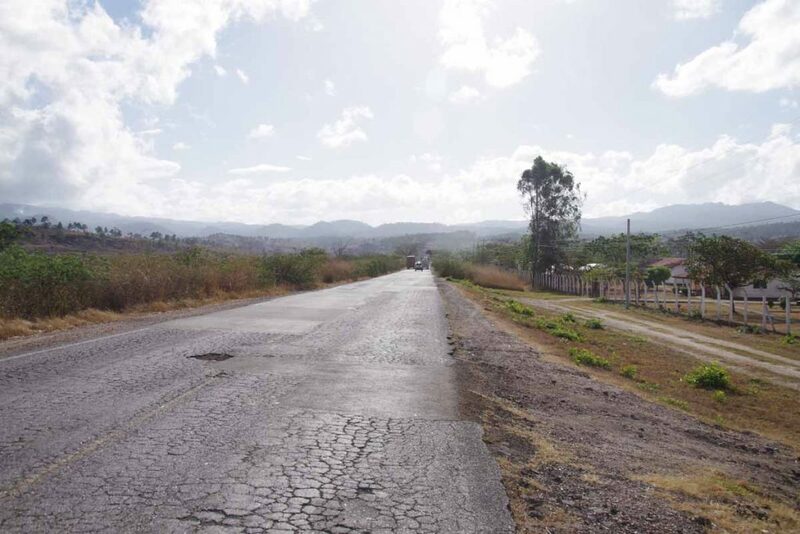 Our road came into broad valley with larger town of Comayagua. 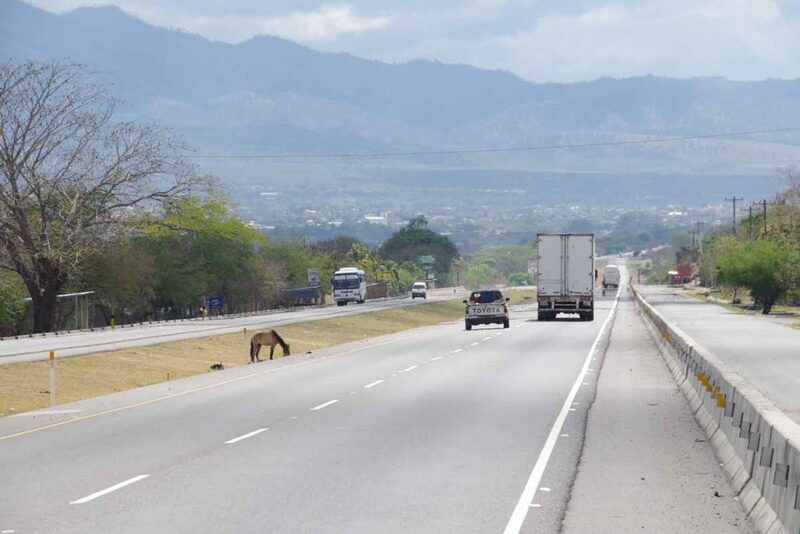 Photo above shows major highway as well as a horse tethered to graze in the median. We did get some cross winds, though not as strong as suggested by this sign. Not much past this, a truck passed as we were cycling along. Heard a loud bang, followed by shards of tire falling onto the highway. I’ve seen these tire remnants on the highways, but this is first time I actually witnessed a tire blowing up. This motel was our “backup option” if we needed a shorter day. It didn’t have much around it though. A few kilometers later we had a nice restaurant that served food buffet style. You would pick out things you wanted and then later learn their cost. The road narrowed to a single lane shortly thereafter. The shoulder was poor and a lot of truck traffic, so kept having to ride a short bit on shoulder, short bit in road and otherwise dodge the worst bits. Fortunately a short bit later the road widened to four lanes with a good shoulder. This was also start of our 800m climb. That took us a few hours. Comedor ISIS was along the way. We didn’t stop here, but did stop at other places to get a drink and recharge up the hill. At least crested the top, went past another toll booth and then more descent down. 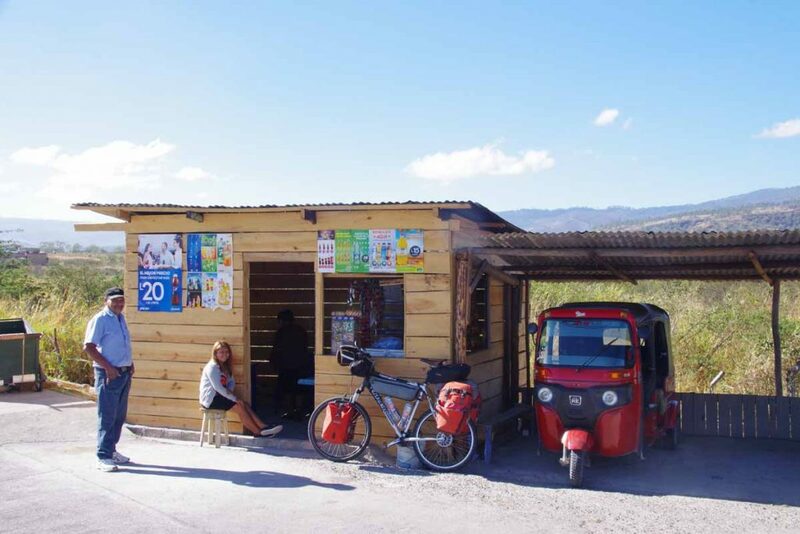 Zambrano even had a tourist office. They told us of the hotel a kilometer further. No wifi there, but otherwise reasonable hotel. Down, up, down – was the overall summary for the day. However, once we got into the city, we also found a lot of short sharp hills. I took off a little early today since the day started with a downhill. A little ways ahead, I saw this truck pulled over to side of the highway. Two guys got out and started throwing trash bags from the bed over the side of a small ravine. Now we know how all that trash appears there. A little past the bottom, I waited at this point. There was a small store to get a drink. 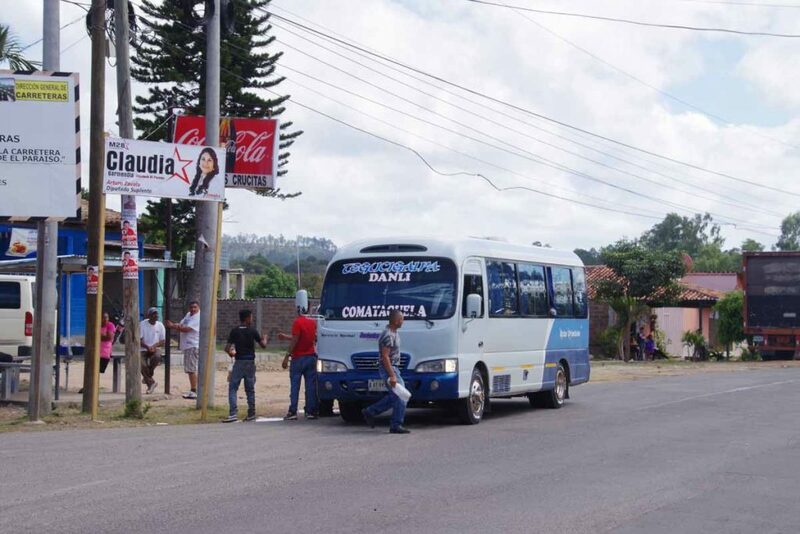 Buses would pull over every 10-15 minutes and people would get on or off. Local destination traffic was handled by these small auto-taxis. Overall a fairly busy junction. After David arrived, we started our climb for the day. Around 500m on a good four lane highway shoulder. We passed a large penitentiary on the way up and stopped once at a comedor for a snack. There was a nice church and cemetary near the top. Turned out there was a short downhill and then uphill again before the final descent. 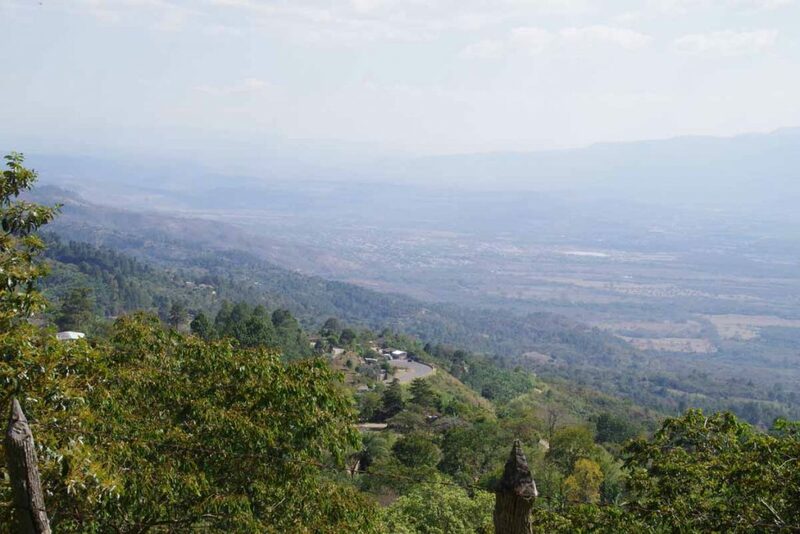 We could see Tegucigalpa (Tegus) down in the bottom. The road into Tegus had good and bad. On the bad side, it mostly narrowed to two lanes without much shoulder. 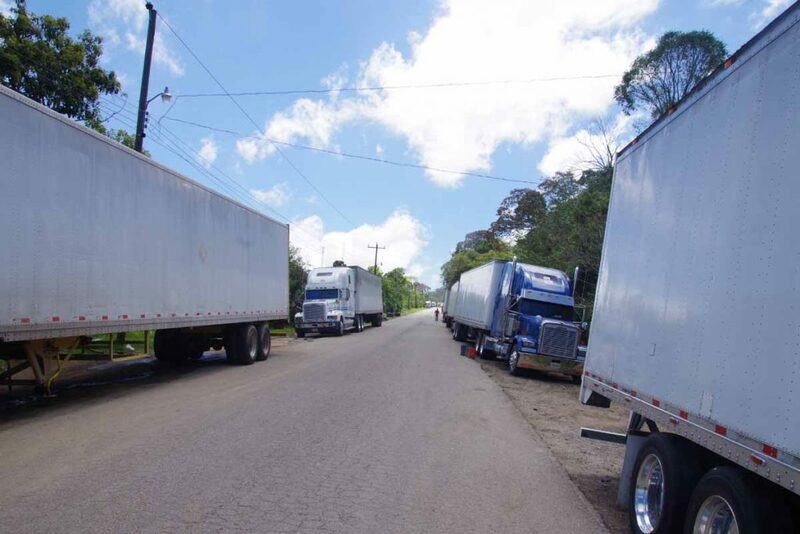 On the good side, there was less traffic so often a chance to ride in the gaps between cars and trucks. The steep hills did make it a bit more challenging. We stopped at a bike shop on the way in. I had been tightening my brake pads as they had worn on previous hills, so wanted a good check to see if it was time to replace. It was time to replace them as they had mostly worn down in our interval from Guatemala City. A lot of steeper hills and me using the brakes a fair amount – but nice to get them back again. After this we cycled a few remaining hills and found a hotel recommended in Lonely Planet. Nice end to a day and not too late overall. Today more than a mile of descent (1647 meters, 5404 feet) but then we also climbed 1075m (3530 feet). Had a Spanish test (oral) to finish the day. I was on the road a little after 7:30am. Went earlier than David, partially because I knew there was a lot of descent and I expected to be slower. It was cooler (~15C or 59F) at elevation and skies were clear. We had a little bit of climb the first 8.5km. 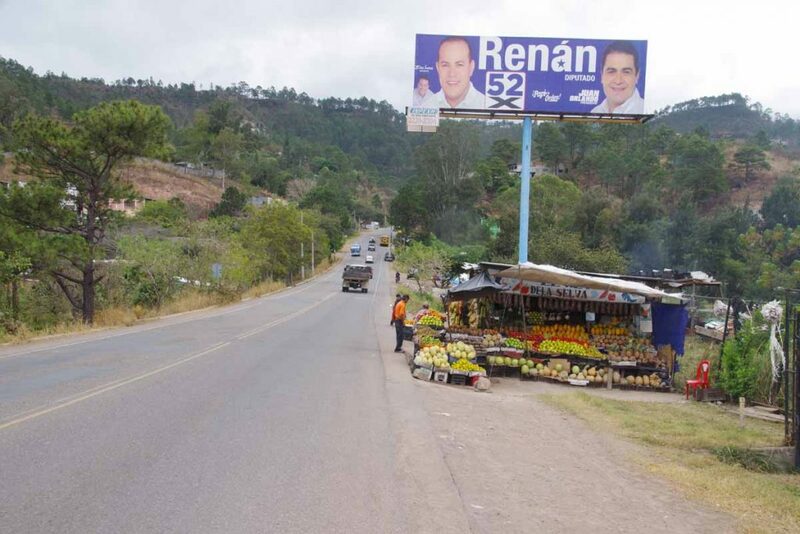 We passed a few more signs related to the Lenca Highlands. After this we had more than 30km of downhill. The road was occasionally rough but the grades were rarely more than 8%. As I descended, I left the pine forests behind and it felt noticeably warmer. Near the bottom, some coffee out to dry. This bridge over the river was pretty much the low spot. I found a comedor on the other side in the shade. Perhaps 15 minutes later David came along and so we could eat a snack and prepare for the climbs to come. By now it was over 30C (86F) and warm. We had a short 3.5km of level before an 800m climb coming up. Again, this climb was rarely more than 8% but it was otherwise long. A little ways up the climb we had a nice comedor to eat lunch. This photo taken more than half way up the climb, looking back on the town in the bottom. Traffic was fortunately light and as we climbed, it also became cooler. 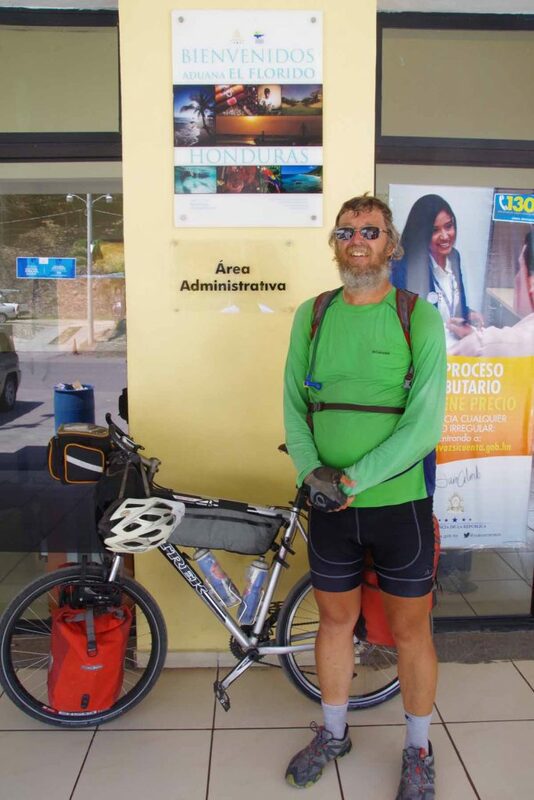 Crested over the top and then finished the day with more descent into Siguatepeque where we joined the major highway leading to Tegucigalpa. It was now nearly 5pm, so we had a full day of riding. The hotel looked a little fancier than some places we have stayed, but overall was less than an average US hotel so not to quibble too much. In the parking lot were was a TV reporter and camera man. The saw the loaded bikes and came over for an interview. Consider this an oral exam of my Spanish language abilities. Fortunately, the questions were all related to the bicycle riding, so mostly things I’ve answered before. Was still interesting though. 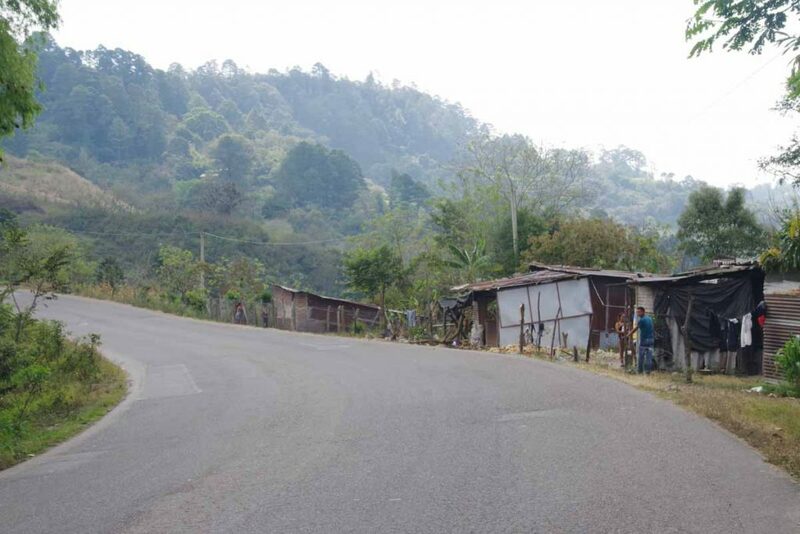 Our route through Central America has many ups and downs. Today was mostly up, 1285m (4215 feet) to be precise. We also had ~1067m (3502 feet) of downhill so ended up at 1710m elevation. We have picked this route partially because it stays higher and hence is cooler than the flatter more lowland routes along the coast. Just after sunset last night. It gets pretty dark out in these villages. Without much light pollution one sees a full complement of stars. 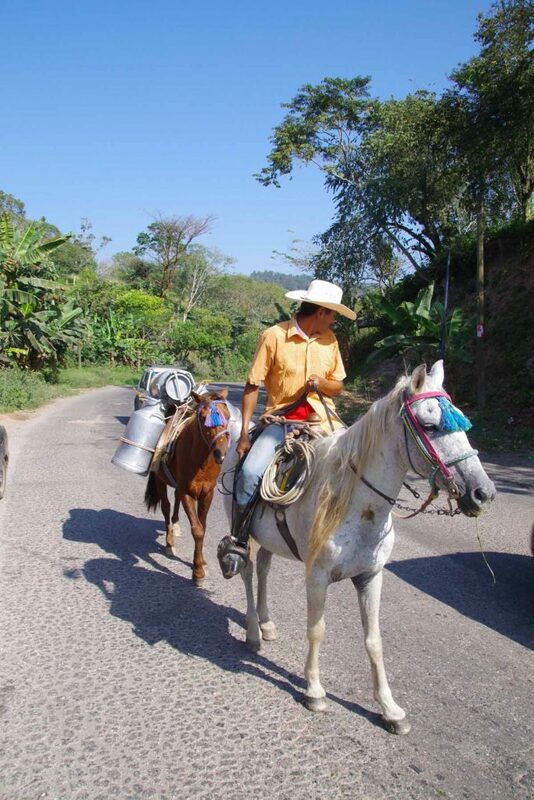 Today we were on a coffee route. I was out a little before David and agreed we’d meet up after “the big climb”. It was still nice and cool, though it didn’t really get hot at all today. 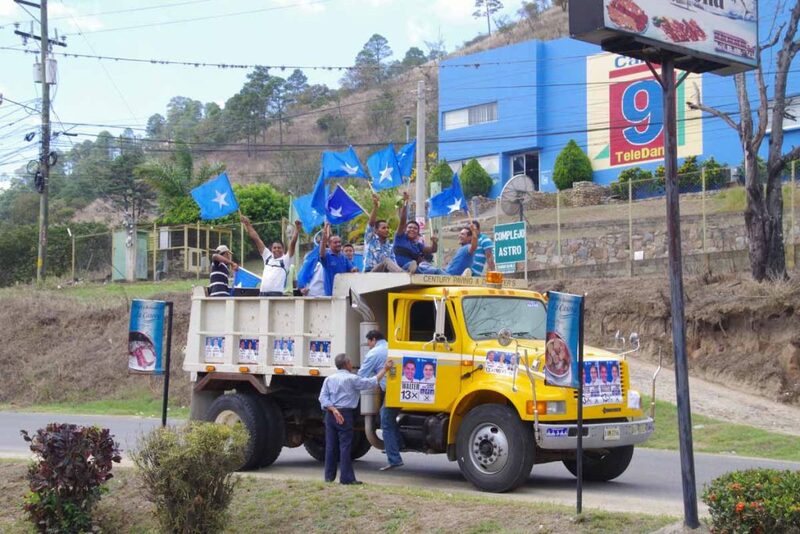 Locals like riding with many people in backs of pickups. I’ve seen quite a few more than this, but typically too late to get a photo. 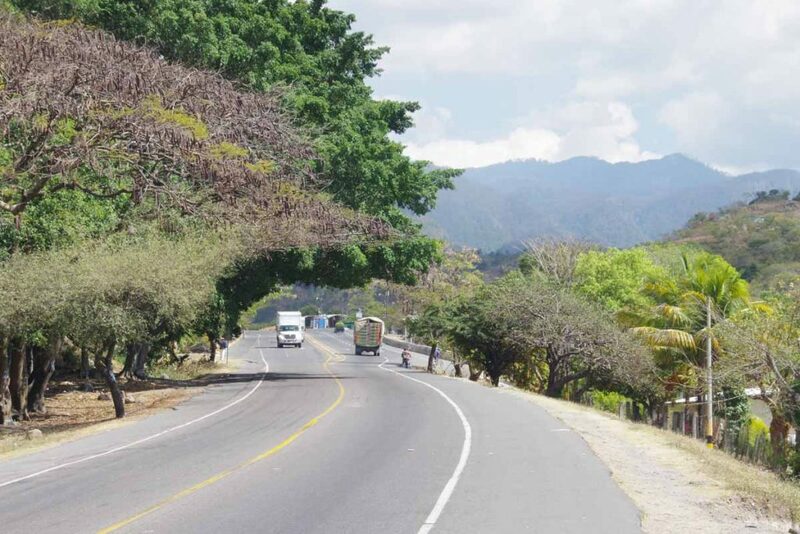 Sometimes with all these folks riding loosely in back of pickups, motorcyclists without helmets and steep winding roads, it seems surprising there aren’t more accidents. However, suspect a side effect is people also watching out on the roads a bit more. 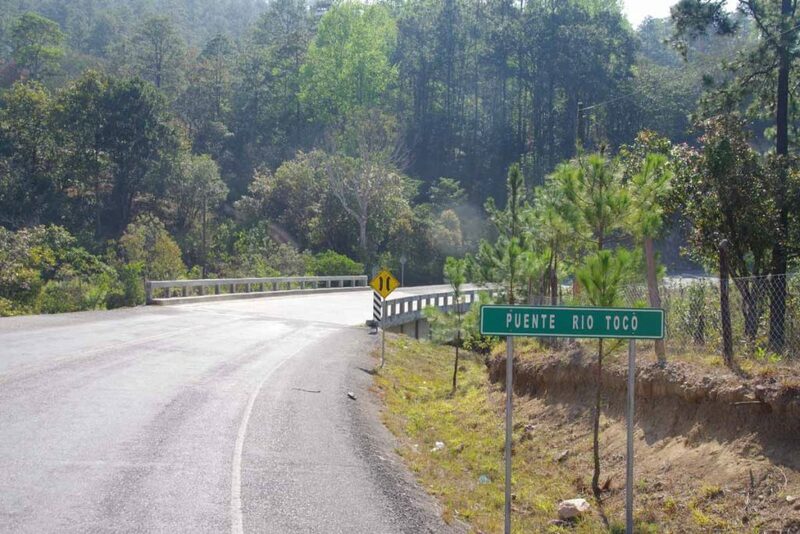 At 19km, Rio Tico was the start of a 580m (1800ft) climb. This wasn’t as bad as I expected with only short sections reaching 10% and much more gentle grades. One started to get some nice views during the climb. 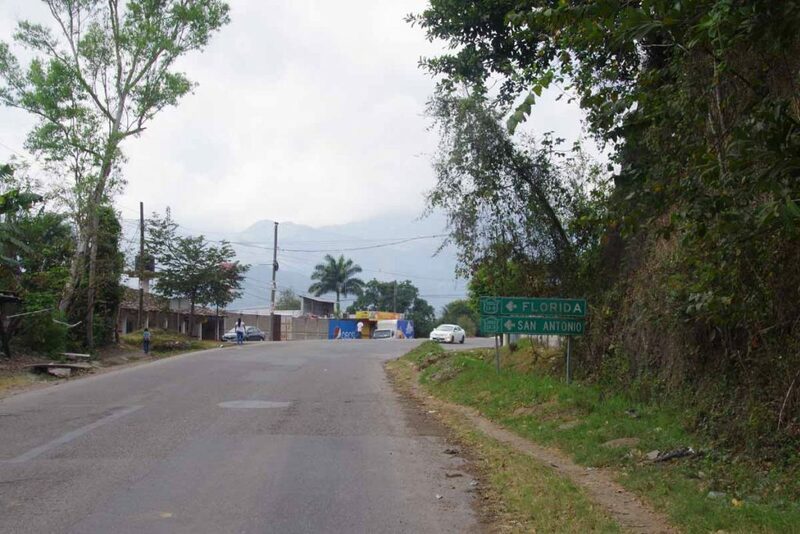 This area is know as part of the Lenca Highlands after indigenous group that lives here. At 30km, I reached the top (hooray!). 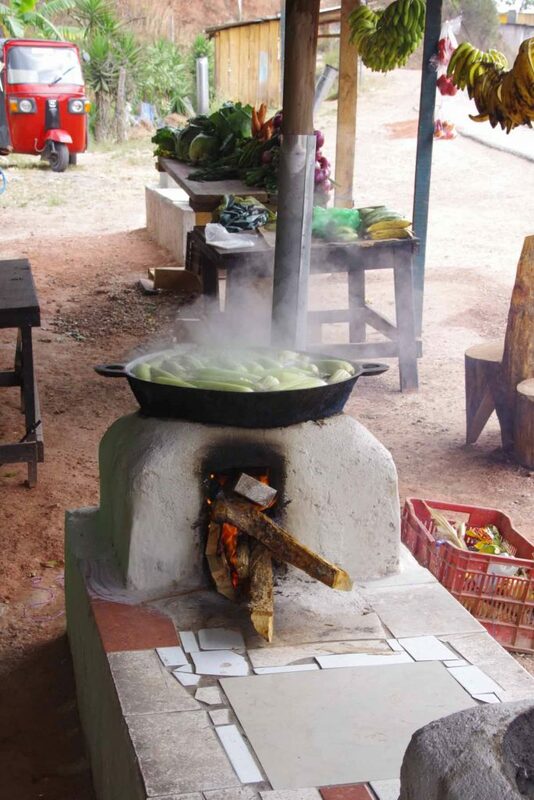 A few kilometers later, I found this comedor. Ordered something and relaxed. Some time later David arrived. After this still some hills but not long sustained climbs. 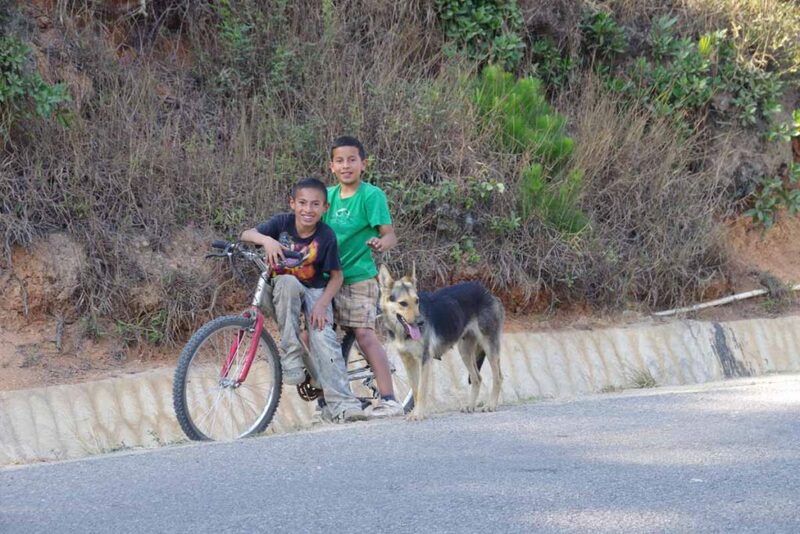 Met these kids and their dog along the way. 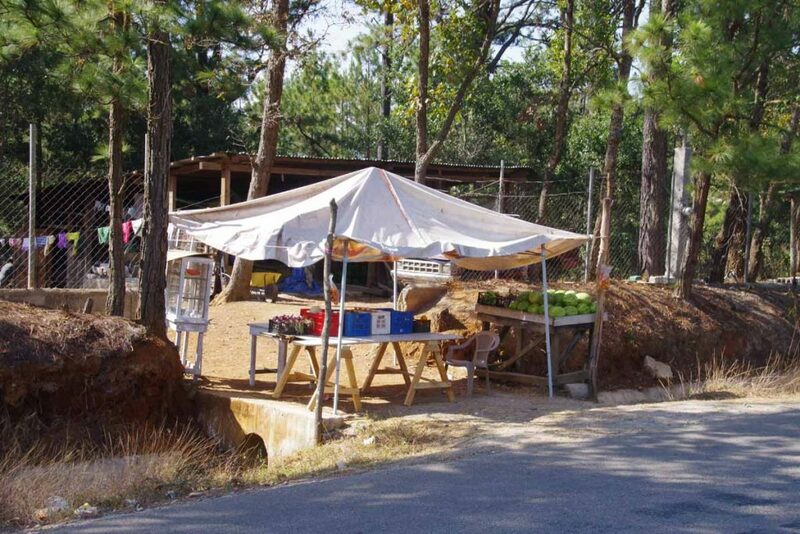 Local fruit stand. Overall, fewer comedors and pulperias than previous days, but enough to get by. 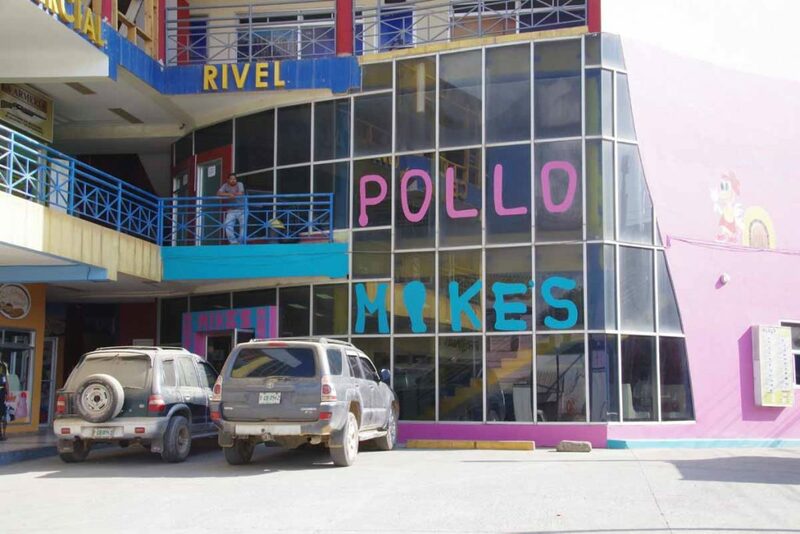 In La Esperanza, I had to get a photo of the “Pollo Mikes” shop. 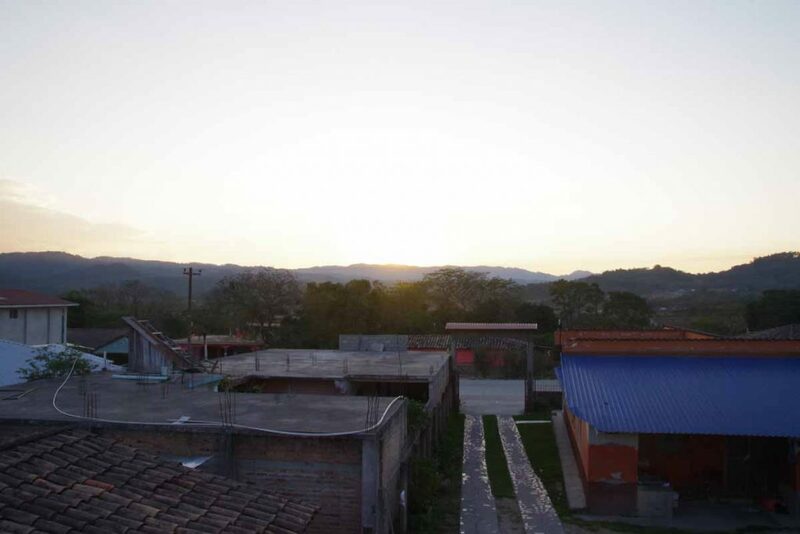 We’re now likely at a high point in Honduras. Still a lot of climb/descent to go but don’t expect to be higher than this elevation overnight. Today was a shorter ride, though still with 945m of climb. Next town with hotel after this is another hilly climb, so we decided to break it into two days riding. Restful day in Gracias yesterday. 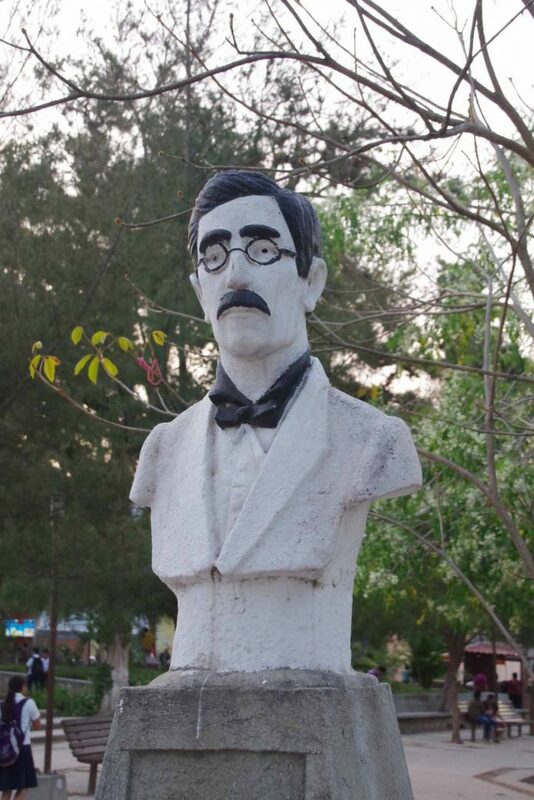 Not quite sure who this is, but his statue was displayed in the park. A few blocks north of the park was a nice pizza restaurant. Otherwise some small comedors, two groceries, a fruit stand, a bakery and we had everything we needed. This morning back on the road. 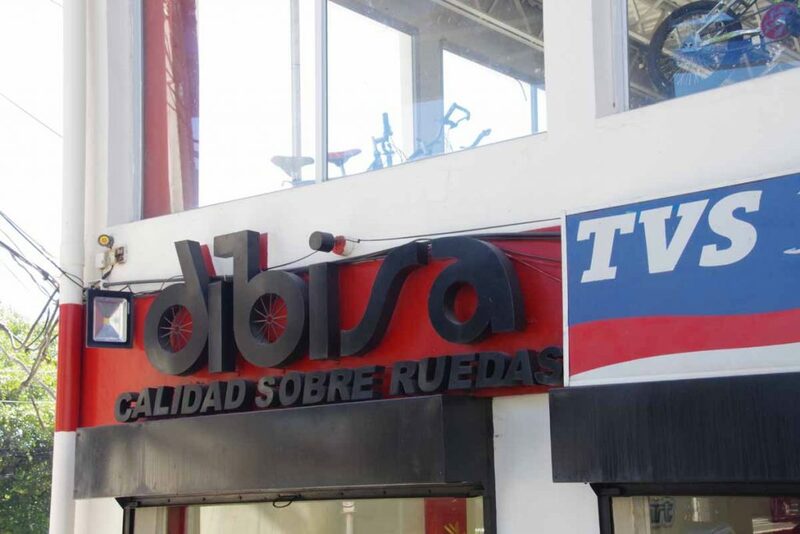 Shop above sells hardware items, bicycle parts as well as electrical items. We started in an area with more palm trees, but today climbed more into pine forests again. We’re also seeing more birds like this one around in the area. Our route today didn’t have many flat bits and we started with a slight uphill and then good descent. After that the longest climb was 300m. The grade was fairly consistently between 7% and 10% but fortunately still cool. Not far past the top was village of Cañada. 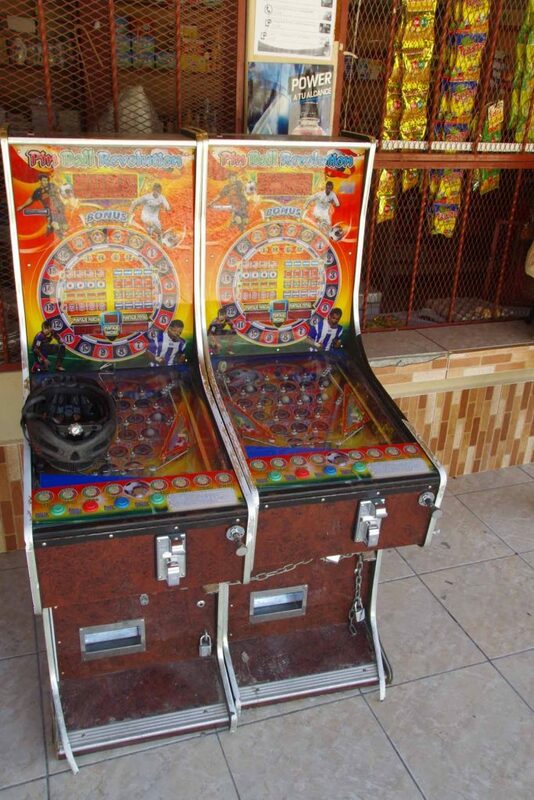 We’ve seen more arcade games in Central America such as this soccer oriented pinball game. This was at a rather large store at 18km. The pinball machines weren’t on and several kids were in the area with their smart phones. Apparently, this is one spot where the wifi signal was free (but password protected) and hence a good spot to hang out. After this our second longer climb of the day. The grades weren’t as steep, but it was warmer than the first climb. On the way up, a car passed and someone handed out a sealed bag with cool water. Thanks! That definitely helped. Top of this hill was near 30km. After that it was more level or even slightly downhill. We passed these soccer players on for a Sunday game. Seemed like a fairly serious group as they also had uniforms. 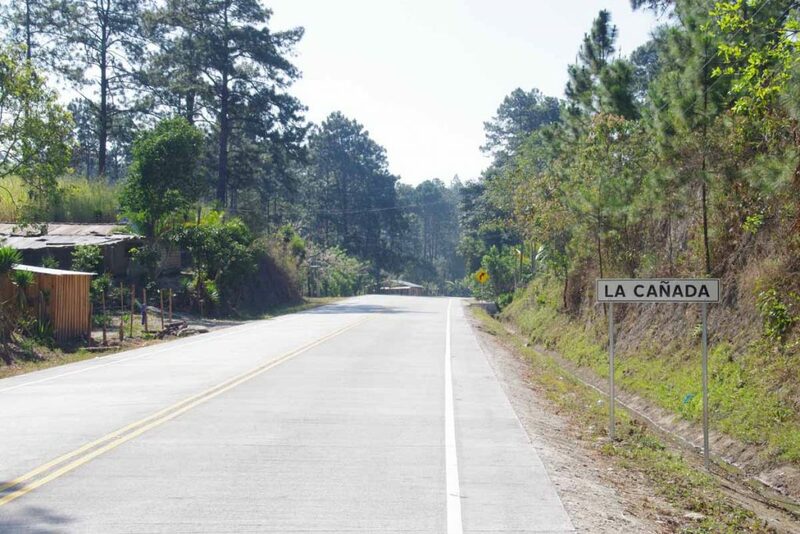 The last few kilometers weren’t difficult and as we made our way into village of San Juan. This is a smaller place than we’ve stayed last few days, but still has enough of what we need. Otherwise a not too difficult day and good spot to take it easy before tackling the next part of our climb tomorrow. 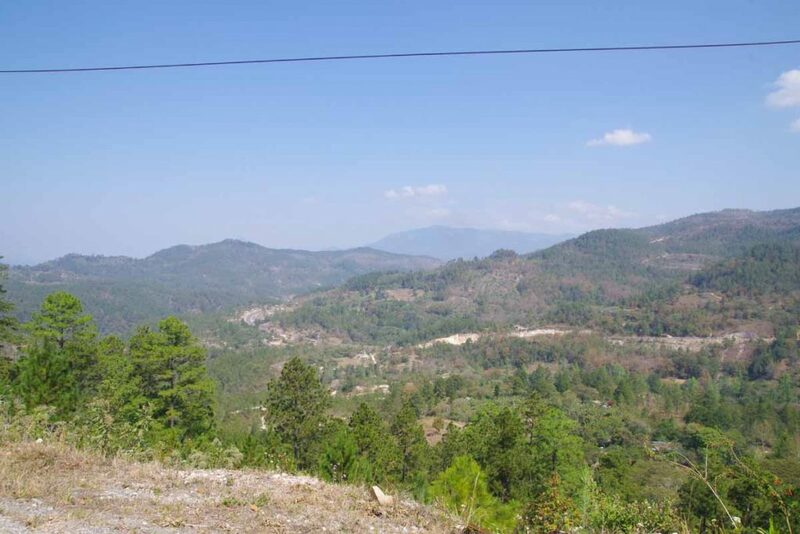 Honduras has some hills. Last two days have been on roads with some short steep hills. Usually no more than 8%-9%, though my odometer has record 12% half a dozen times as well. I can put it in low gear and power up the short hills at 12% and almost find it at least as challenging to descend since I like to go slow with my speed. Only 44km but over 1200m of climb. Today was mostly climbing, with several short steep hills that would get to 9%-11%. Tough work, particularly in afternoon as it got warmer. After leaving our road junction we took the main road south. Traffic was not as heavy as I expected. However, occasionally the road would have potholes and bad patches. On our side of the road, you would steer your way past them as best as you could. 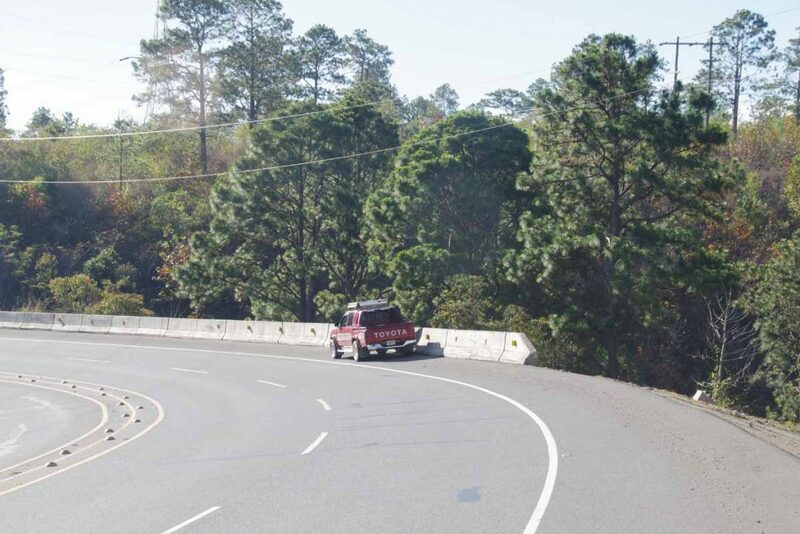 You also needed to keep an eye out for traffic coming from other side that was swerving to avoid holes. However, with not too heavy traffic and no center line, it worked fine. 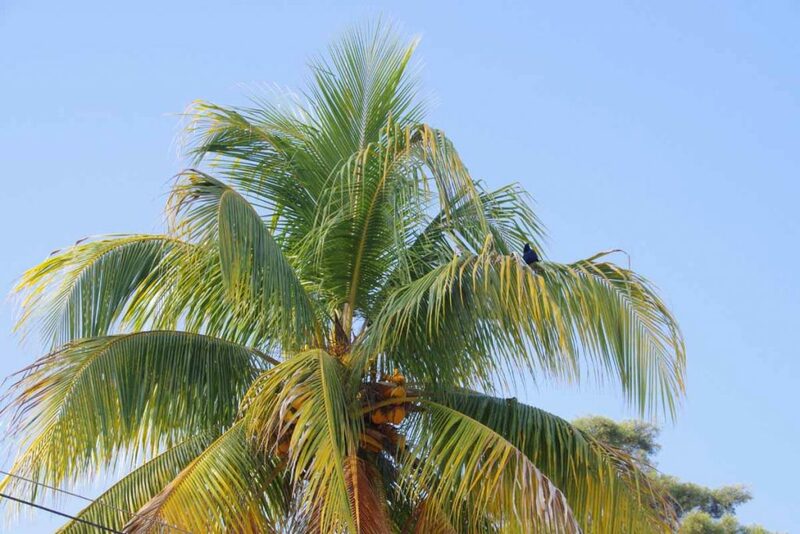 Photo above an example of coconut stall found along the way. Here was a dairy farm that we passed. We’re seeing more dairy cows and also meat cows here. Also the occasional horse as well. The horse behind was being recalcitrant about being led. This pulperia was on top of a steep little hill. Nice spot to stop and get a cold drink. Some of the houses we passed were very basic. Constructed from sheet metal and otherwise pretty simple. It stayed somewhat cool until 10am and after that it was somewhat warmer. We climbed to high of 900m before descending back to 690m. After that a steep climb over 1000m again. Stopped here and talked with some kids. They explained they attended school on Saturdays and Sundays and hence this is why they weren’t in class on a Thursday. 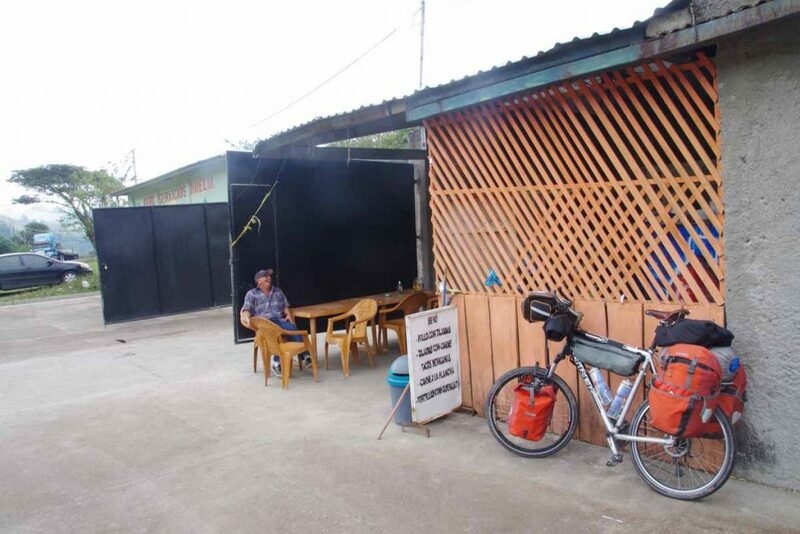 We found a nice restaurant at a coffee plantation at 31km and had a bit longer break. 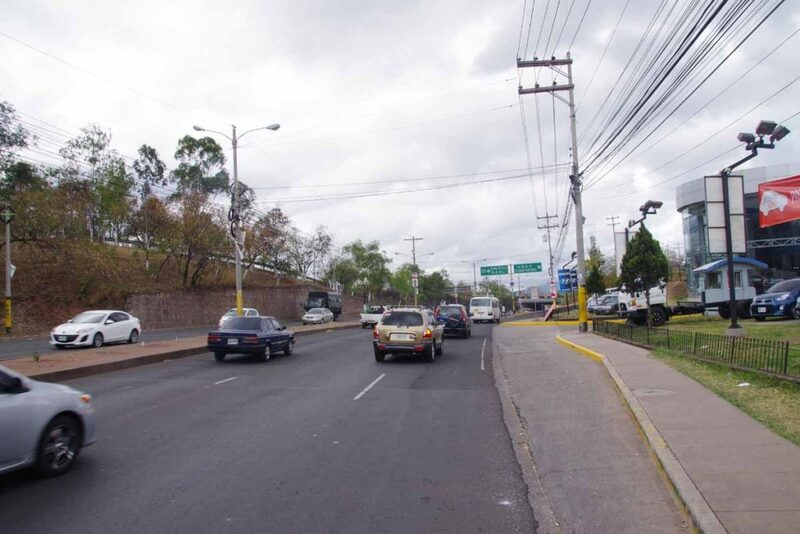 After that, we came to the T junction leading off to Santa Rosa Copan. There was a hotel here, but no wifi, no shops nearby either. Hence, we headed into town. First two hotels were rather expensive but with some extra hints and clues we were able to find a reasonable one. Not a huge distance today, but the climbing and particularly the steepness made up for it. Another shorter ride with lots of steep bits. First order of business was to cycle back to our road junction. From here a bit more climbing where I could see over Santa Rosa. After this 500m of descent, some of it registering at 12%. The road surface however was good on both the descent and throughout the day. These guys had their wares out today. Once I got to bottom of the hill, the next section sort of followed a river. It would still climb over short hills however. Had a nice little break in the pulperia here next to the river. After this, the next 6km into town was mostly uphill though not extremely steep. Cobblestones in this town aren’t too bad. A bit of a touristy place, so multiple hotels to choose from. Hotels in Honduras all seem to request a passport number as part of the registration. Another difference I’ve noticed with Guatemala is there are local buses, but they aren’t quite as flamboyant as the chicken buses in Guatemala. It was nice to get in not too late in the afternoon and avoid more of the hot hours of the day. Cloudy, overcast and almost drizzle. It rained more heavily overnight. Today we had a few drops of drizzle but barely enough to get the road surface wet. As a nice bonus it stayed below 25C (77F) all day, a welcome change from previous afternoons. Our road was not particularly busy today. We still had some trucks passing, but typically plenty of room. There were several shorter steep (~9 to 11%) hills to climb over and a longer descent in the afternoon. We also had one or two short gravel patches, but overall good road, not much traffic made for a nice cycling day. 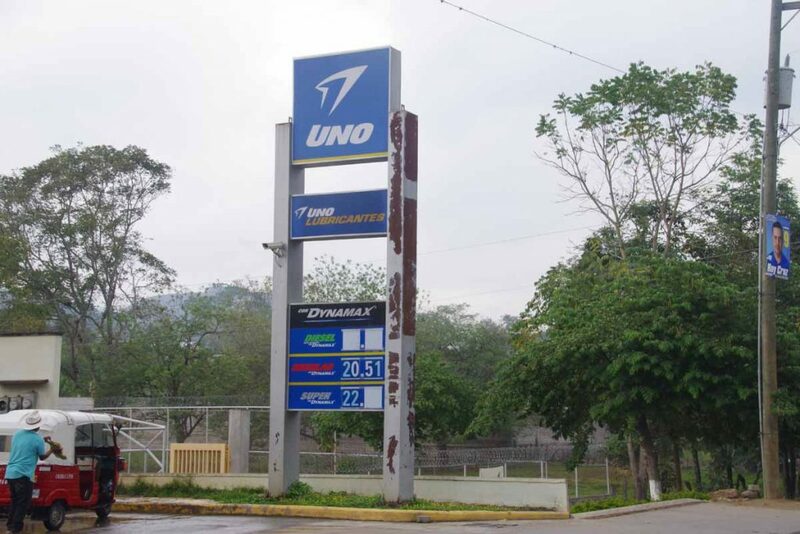 Gasoline is now sold in liters here as compared to Guatemala that sells by the gallon. 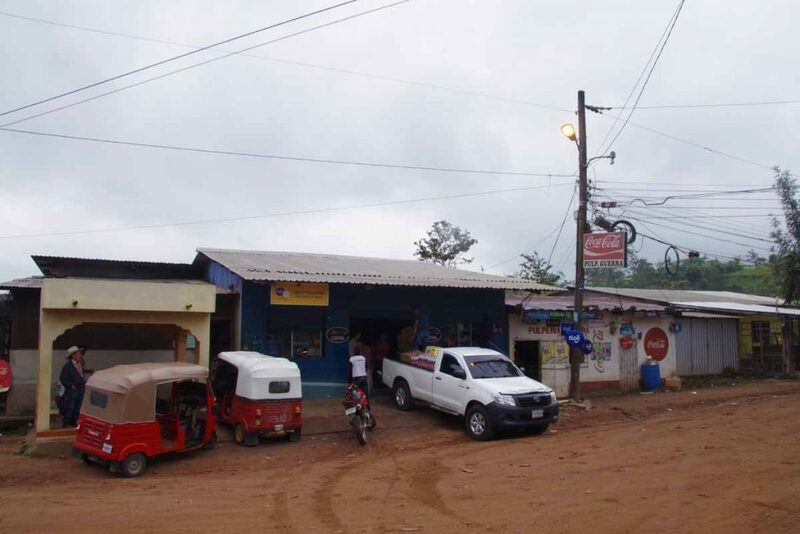 Our first village stop was around 10km. 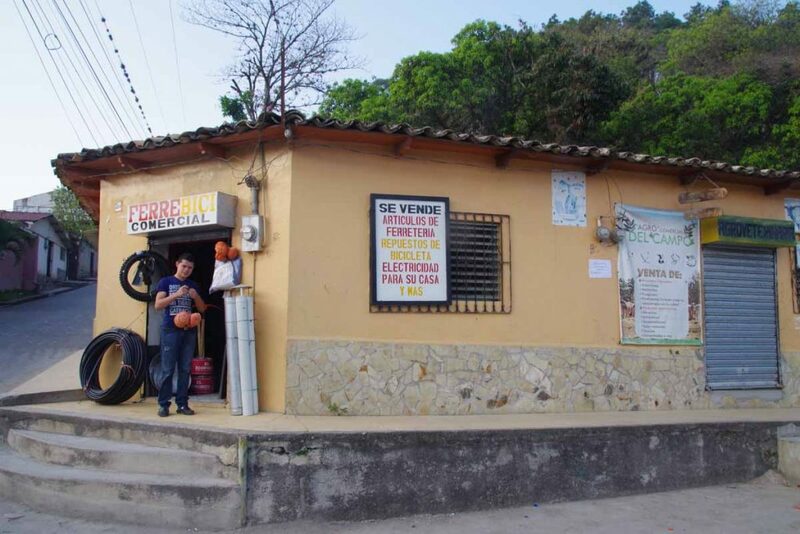 They call these small stores “pulperia”. 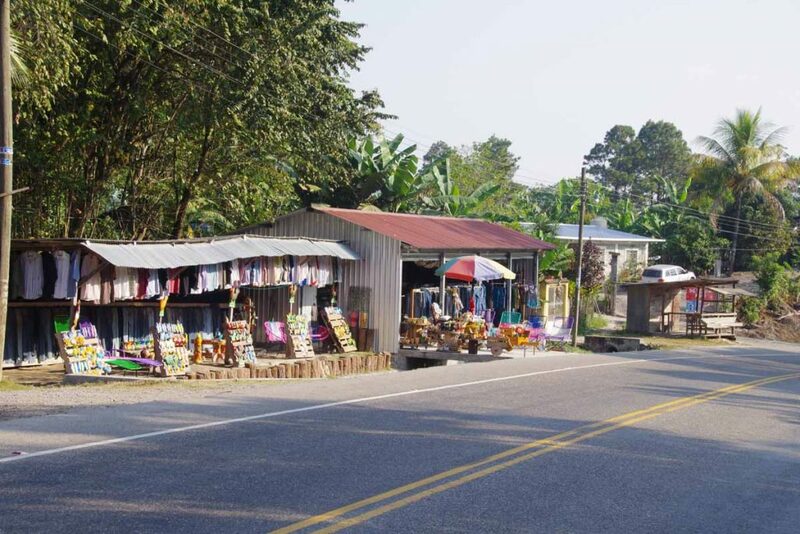 In Mexico or Guatemala, “tienda” was more common. We stopped at one to get a snack before a longer climb up the hill. 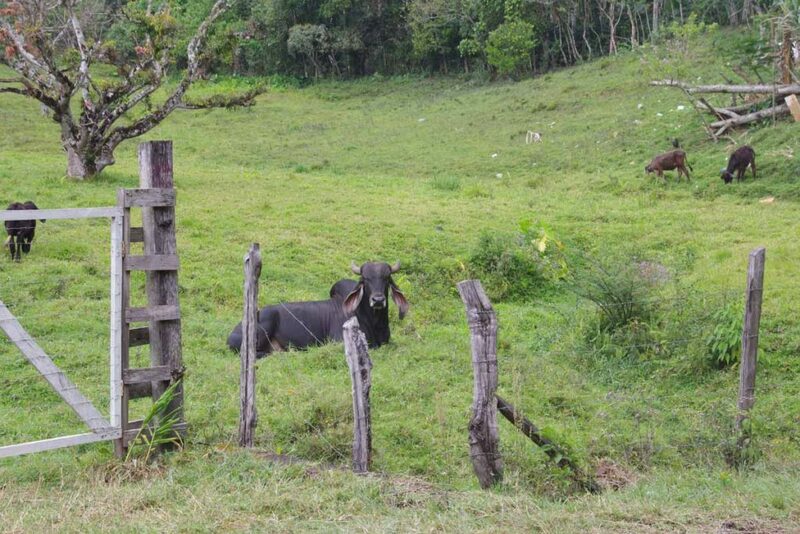 We’re seeing more cattle here and in general the area looks more lush than few days ago when we were in Guatemala. On the way down the hill, we found this comedor and stopped for lunch. As we ate lunch more people came by and by the time we were finished there were almost a dozen there. Coincidence I’m sure, though some were rather curious at these strangers with bicycles. One small girl kept looking at how tall I was. 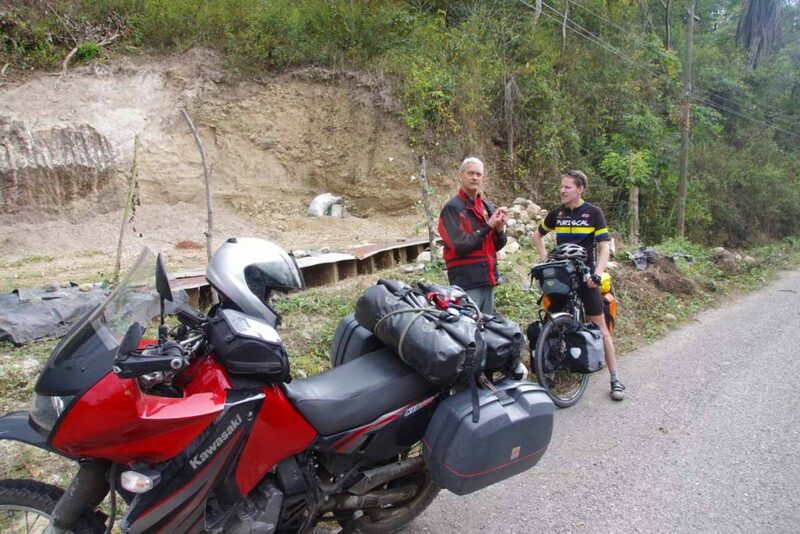 We met this motorcyclist on his way to Columbia and had a short talk. 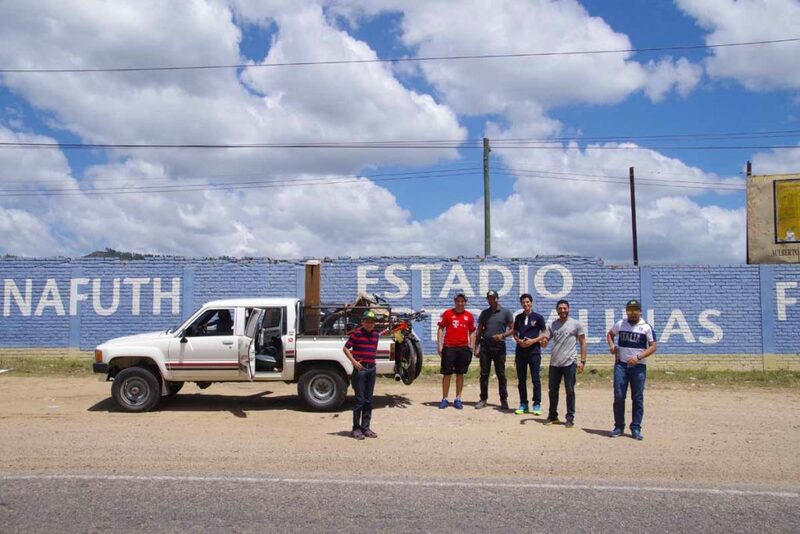 Florida and San Antonio were last places we passed before making our way to major road intersection at La Entrada. 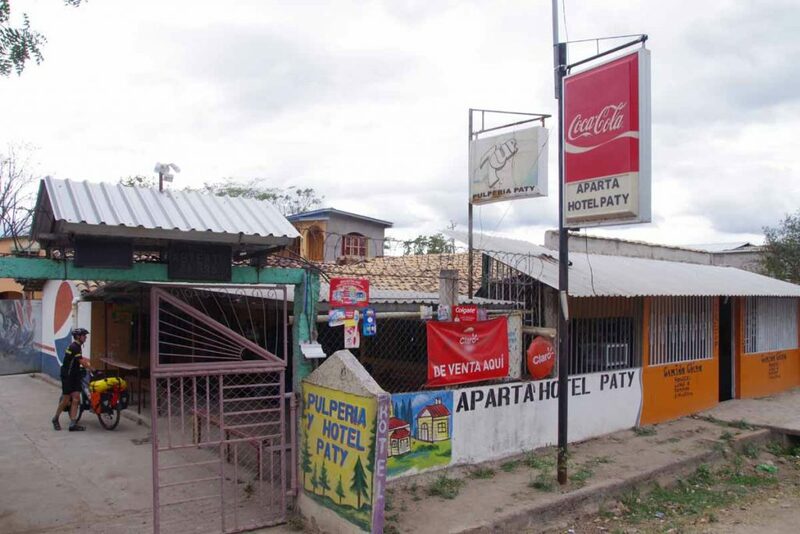 Several hotels around the main intersection and without much difficulty we found a reasonable one. Overall, nice to have a somewhat cooler cycling day and one where we had hints of rain, but not much real precipitation. 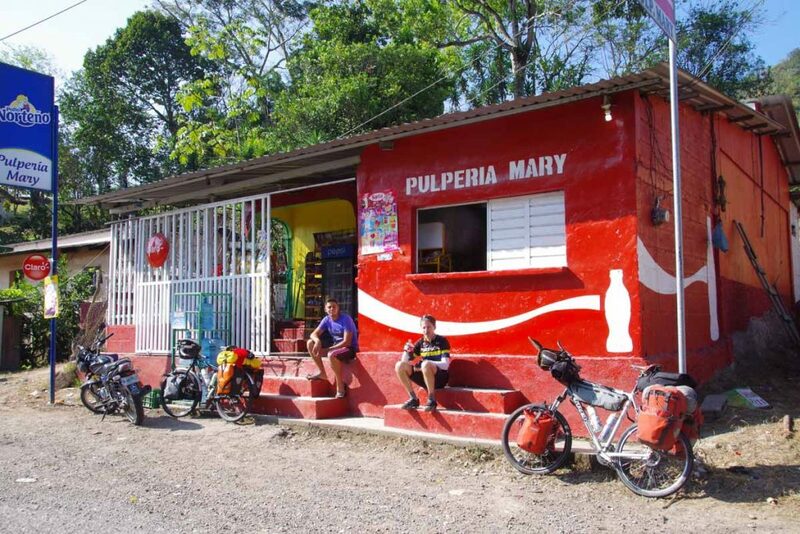 A shorter ride that crossed into Honduras. Our route brought us across several short steep hills where my odometer recorded 12% grade or better. 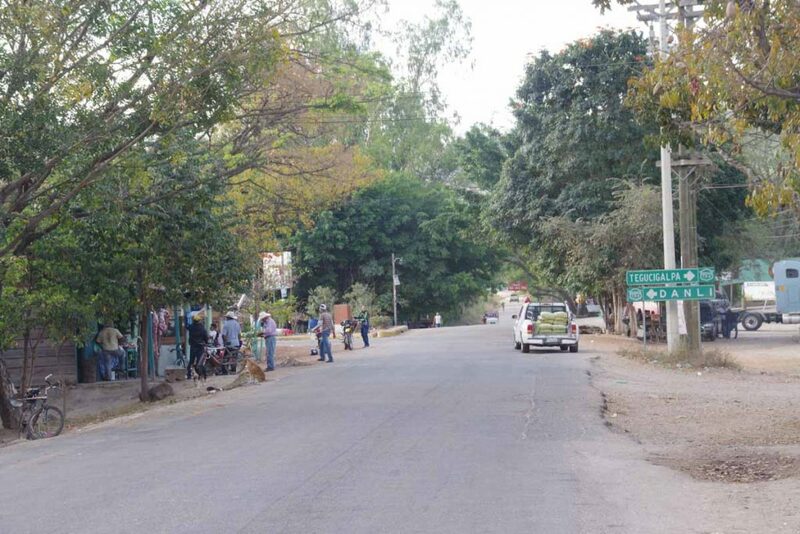 Jocotan was another nice little town to visit. By now we’ve got our rhythm down: arrive in town, find a hotel, shower and wash some clothes, check internet, go out for dinner at local comedor, buy breakfast foods, relax and fall asleep. We were on the road a bit later, but knew we didn’t have as far to go. What we didn’t know completely was that some of the hills were steep. 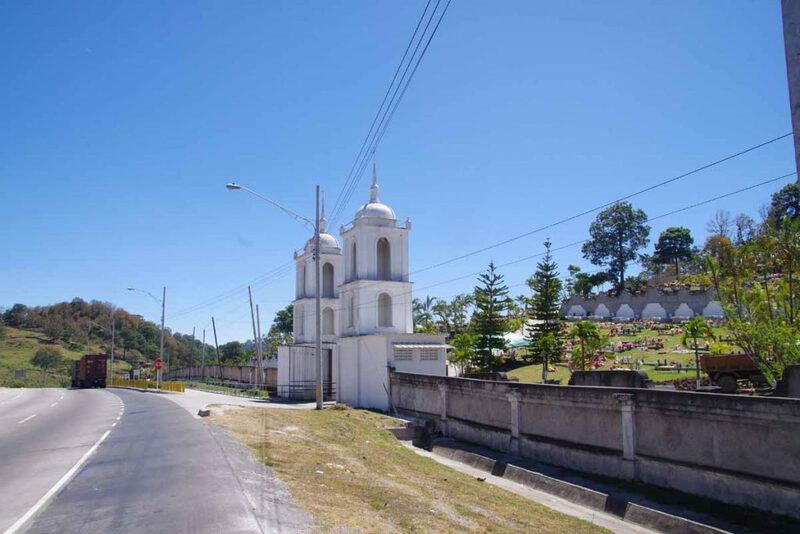 Photo above was looking back at Jocotan junction into town. We crossed a larger river that was running fairly clean. This is an agricultural region. Corn and beans are grown here. 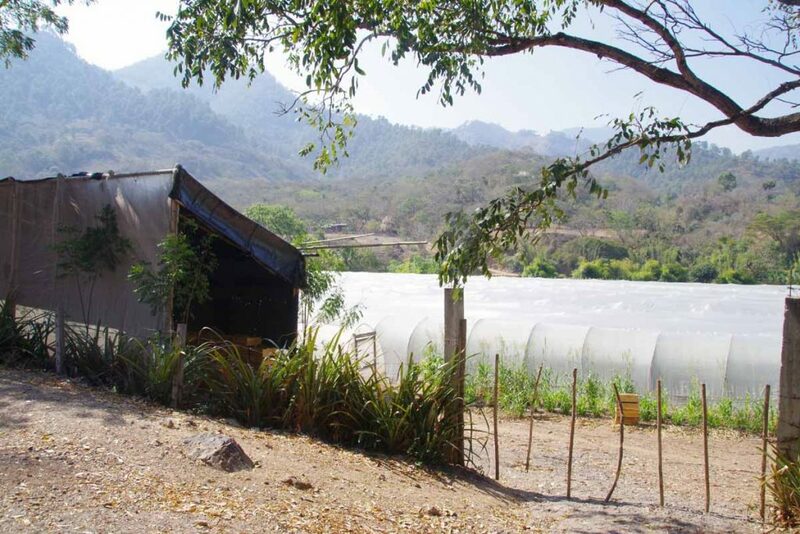 In addition, something in these large greenhouse structures we passed. 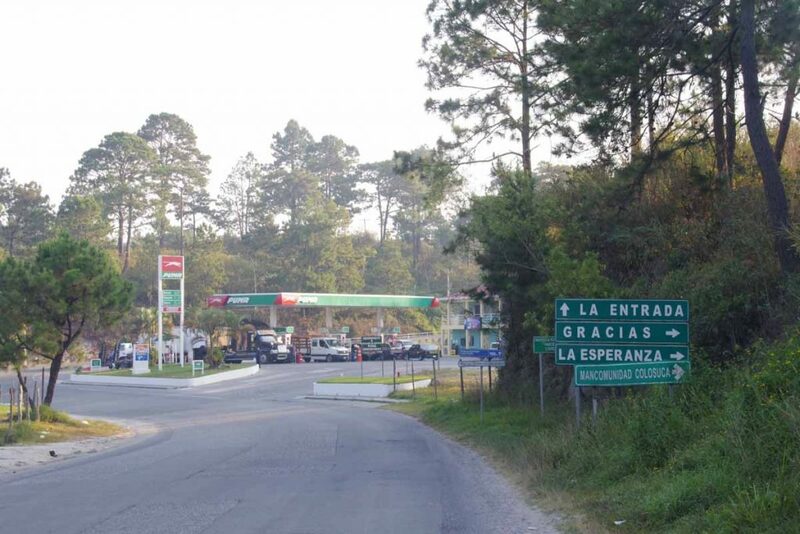 At 25km we came to the border. 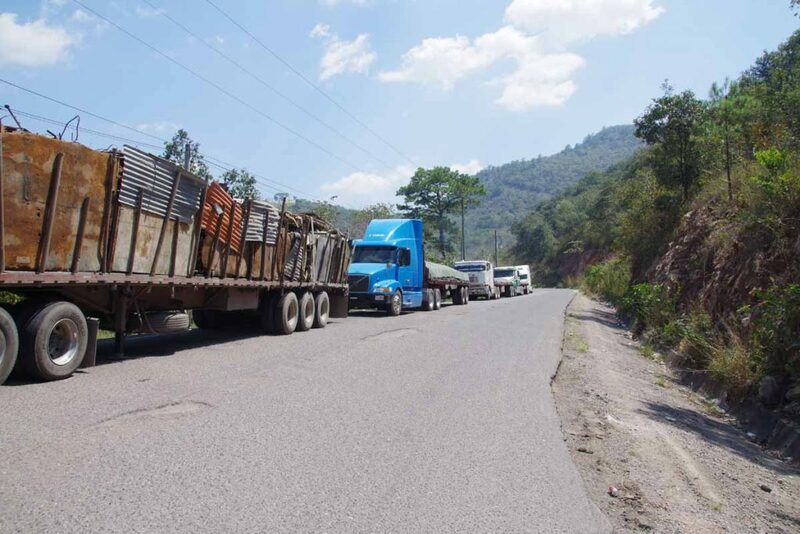 There were large lots with trucks on the Guatemalan side, presumably waiting to cross. 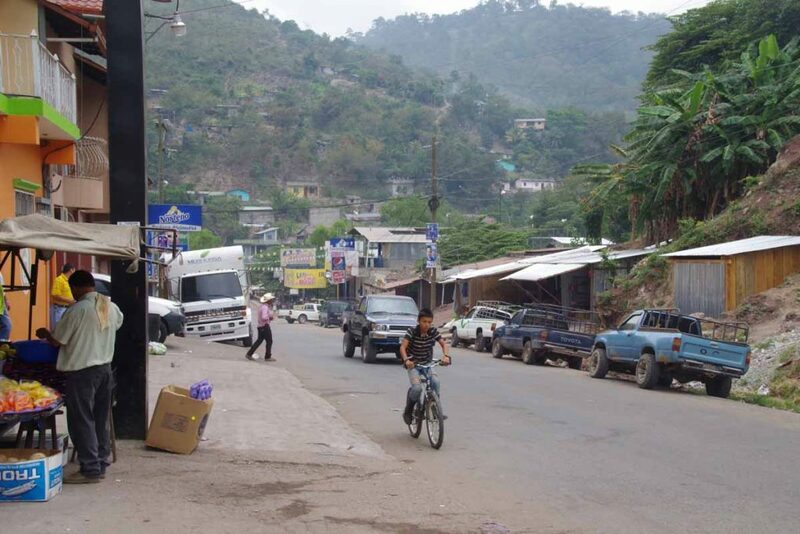 However, unlike our Mexico/Guatemala border, less of the border villages on either side. 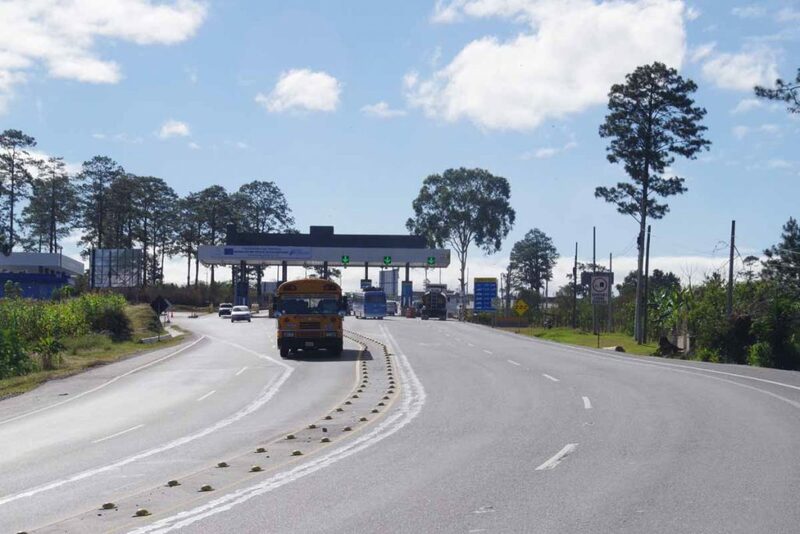 Immigration was also straightforward: get stamped out of Guatemala, cycle over to Honduras immigration and get stamped in for Q30 (~$4 US). 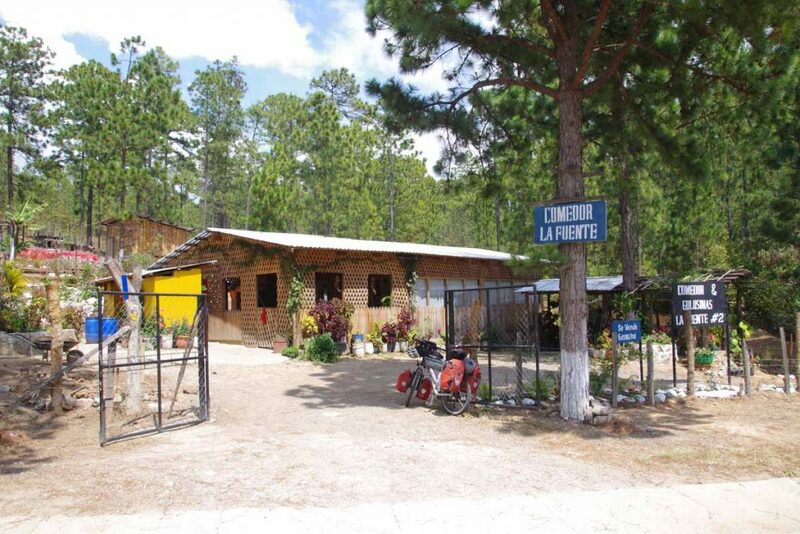 Photo above is taken at the immigration point with poster of Florida, Honduras. I was also able to exchange my last Quetzals for Lempira. The rate quoted was very close to the official exchange rate. Enough so that I was cautious if there was something else going on. However, we’ve been able to spend those Lempira we exchanged so looks ok. 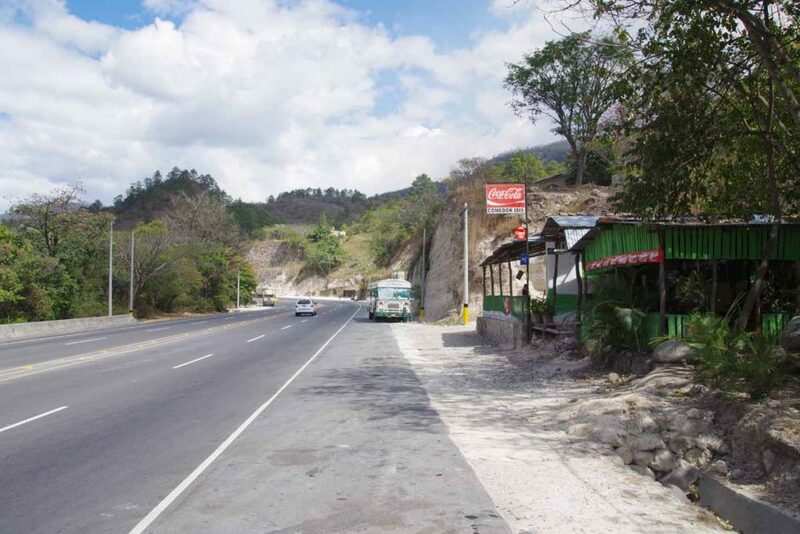 Immediately after the border, the road climbed steeply (~9%). There was a row of parked trucks here. By now it was warm but we also knew we didn’t have as far to go. Up ~200m (600ft) and then across and down into Copan Ruinas. 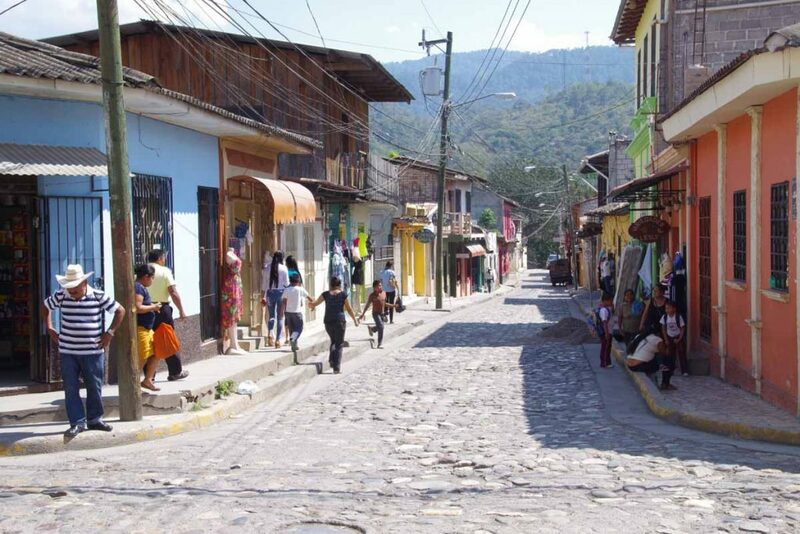 Most of the streets in Copan are cobblestones. Nice to look at, but a pain to ride our bikes. Fortunately, we found a hotel not far into town. 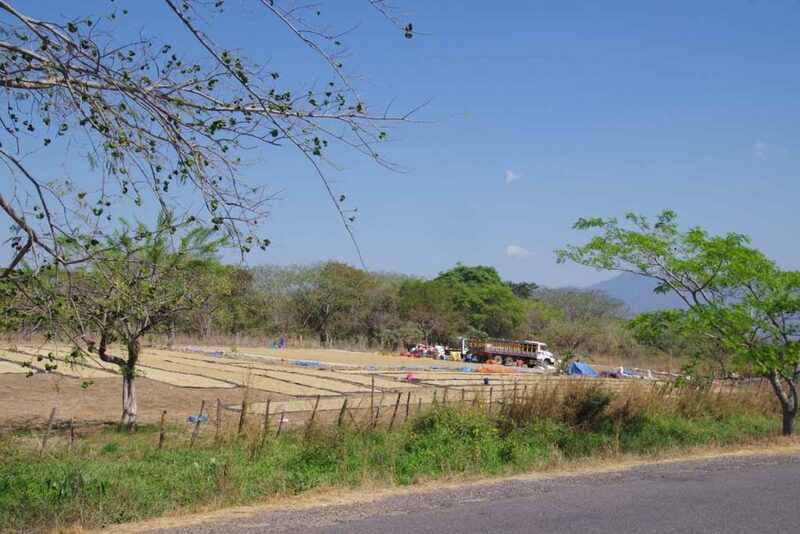 We haven’t visited, but Copan has a major archaeological site. 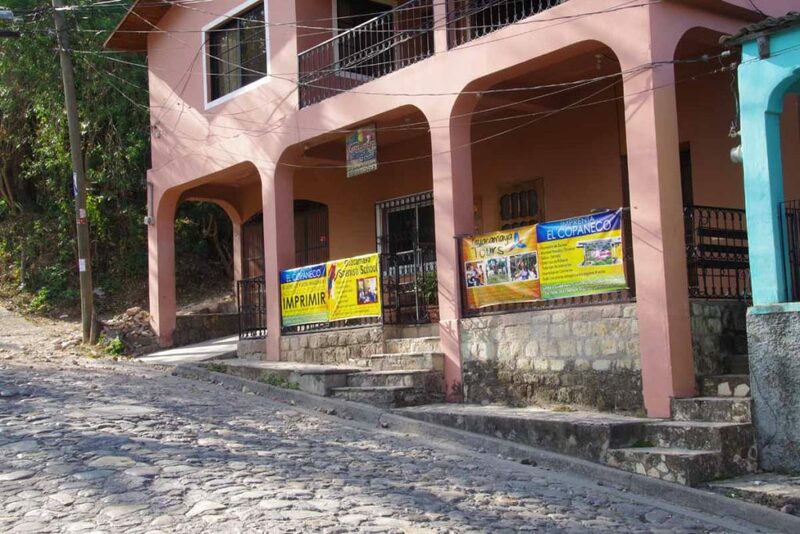 As a result, there are many hotels and also seen a number of non-Honduran tourists walking around. In addition as you can see from photo above, several Spanish language schools here as well. 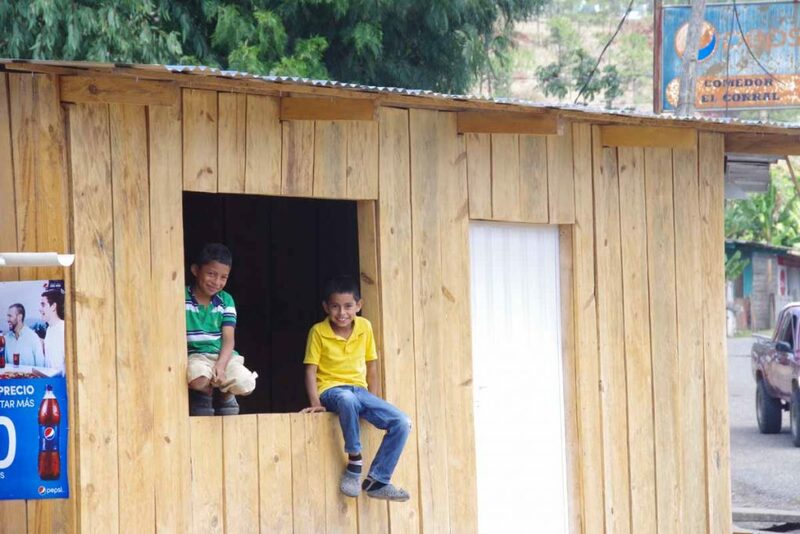 Too early to have much of a comparison between Honduras and Guatemala. 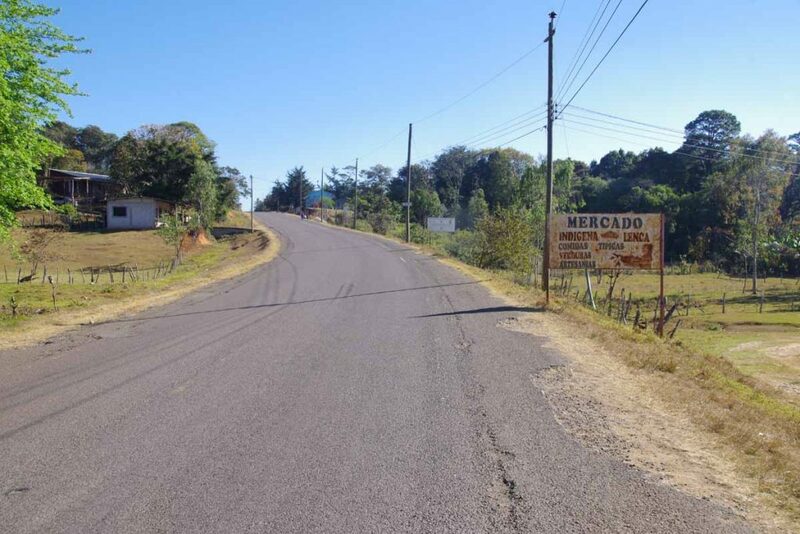 Our small bumpy road got better at the border. 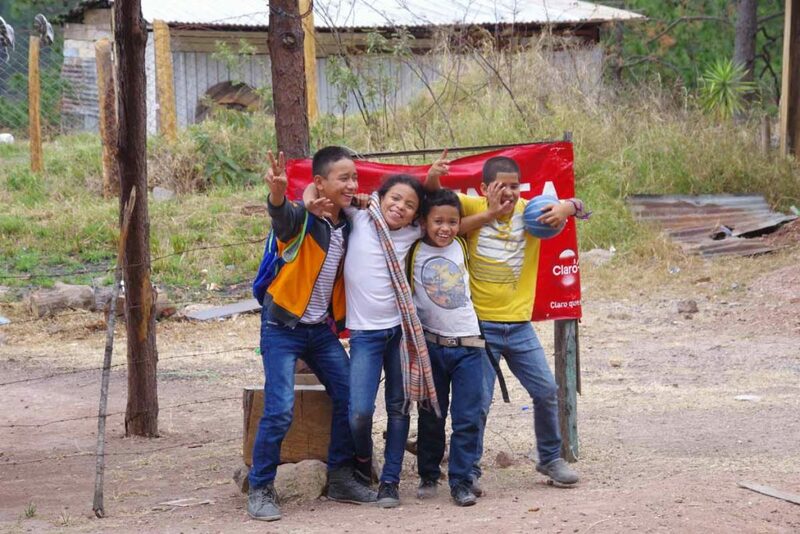 Kids still yell, “gringo!” as we pass. Speed bumps are still named “tomulus”. Looking forward to exploring a small bit of the fifth country on this trip.